Introduction to my website - natuurfoto's van andius teijgeler! This website is primarily made for Nature and Photography lovers. So the photo's are the most important part! For this reason I have not translated all pages to English. Only the blogs I write will from time to time be translated into English. The basic set up of the website is simple. First on the homepage my blogs are published. 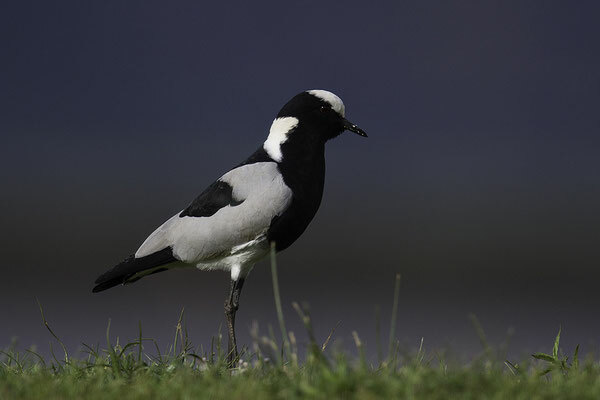 In Portfolio you can find pictures of birds and mammals split in Photo's taken in the Netherlands and Internationally. Further on photographs are presented based on the countries we travelled to. The last two headers are for experiments I do and for the recent pictures. 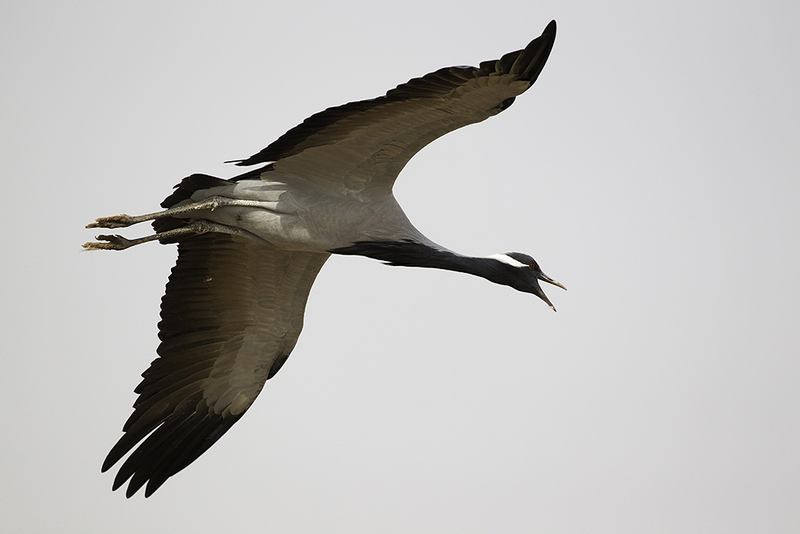 Visiting the Khichan Brid Sanctuary during wintertime is really interesting for both birders and photographers. 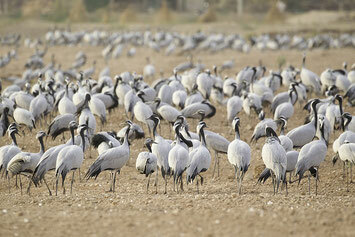 It is the spot to see Demoiselle Cranes at this time of the year. It all started when a former inhabitant of Khichan returned to his home, after looking his job. His uncle motivate him to take care of the local birds in the village by feeling them. It is part of the Jain belief to take good care of birdlife and he took his taak seroiusly. 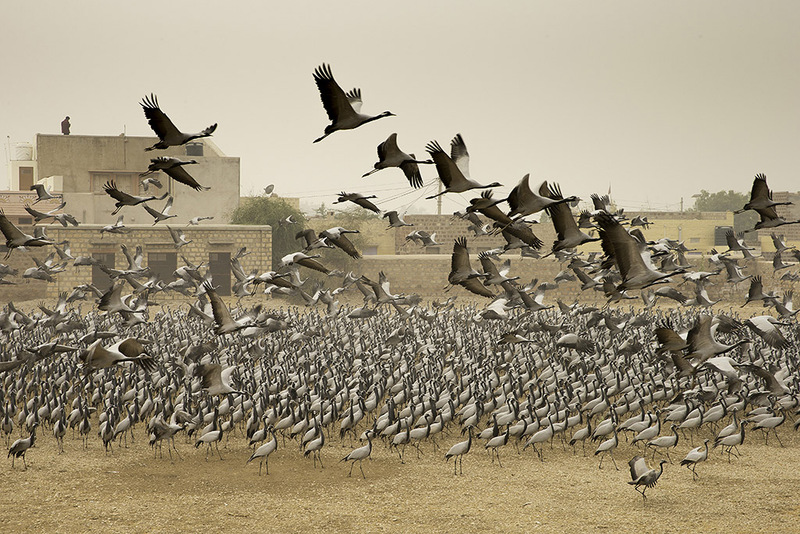 The doves were soon accompanied by a small number of Demoiselle Cranes. 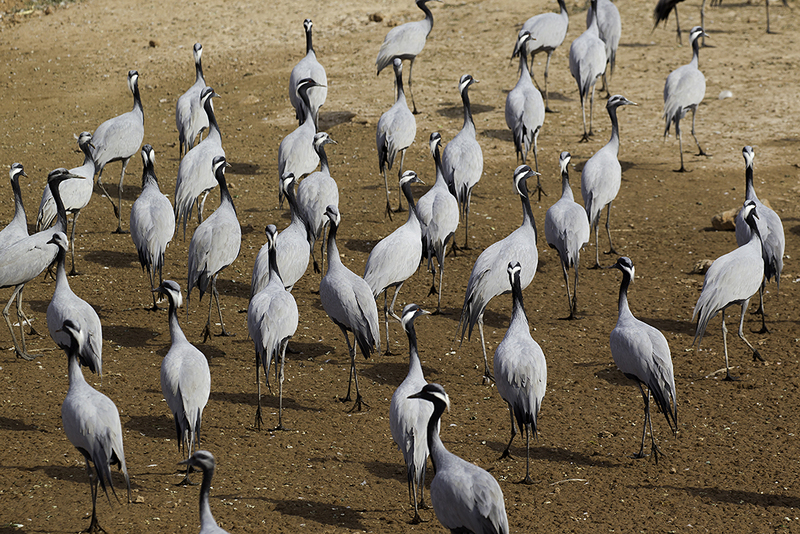 During the following years the numbers started to grow and today it is Saïd that during wintertime up to 10.000 Demoiselles Cranes visit the area. In order to visit the feeding and Sanctuary I would recommend you spend at least one day. We artived at 11.30 and left the next day around 11 o’clock. The nearby City of Phalodi has an acceptable hotel and is a good base for the overnight stay. 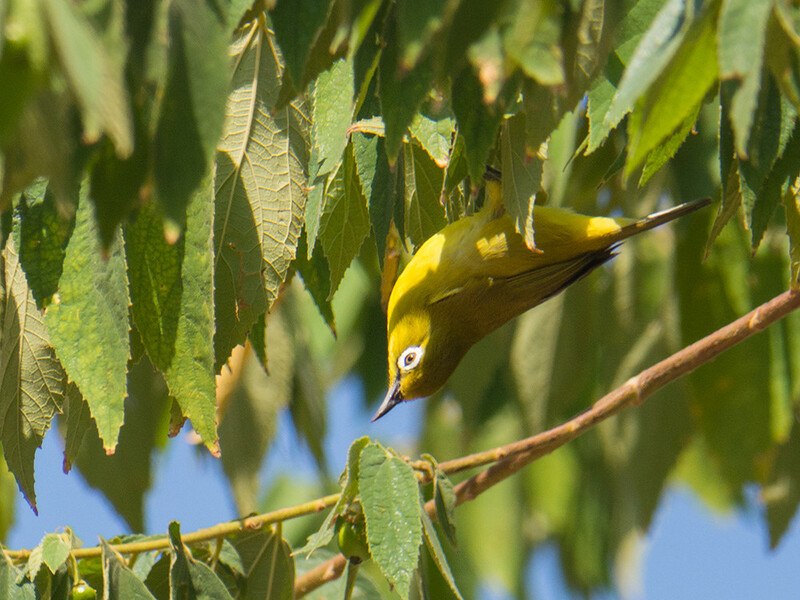 t is easy to find the Khichan Bird Sanctuary with Google Maps. 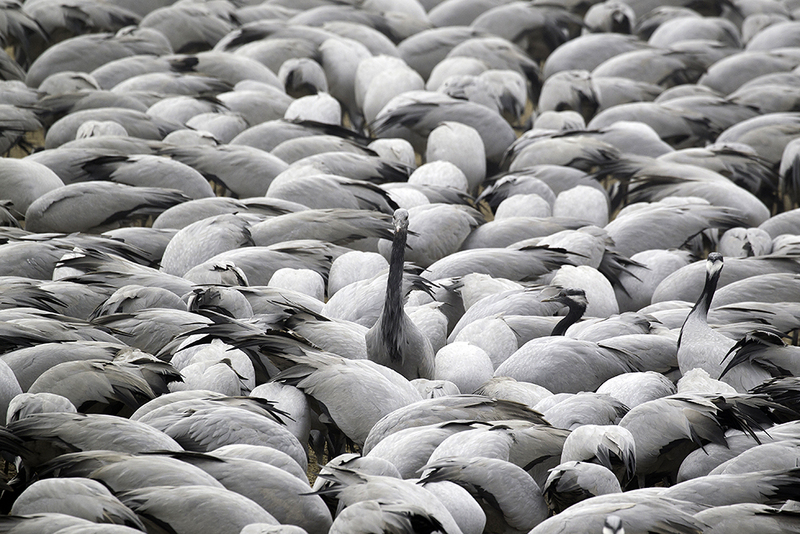 A parking area is available and after climbing the stairs, one sees a small water, where the Demoiselle Cranes have gathered. 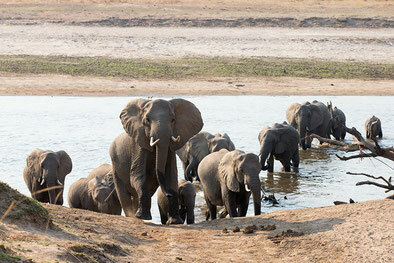 Large groups come to drink and when disturbed by the local doos or cattle fly up. 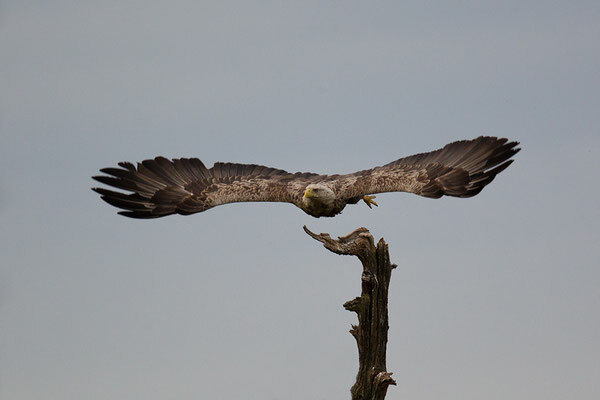 Difficulty is to get photo’s that are not one big mes of birds. Important is to look for rhythm and synchronicity. Getting to a low position leads immediately to disruption and more or less impossible at this water. At a few hundreds of meters another small lake offers slightly better opportuniteit to get low. I tried It close to Sunset and IT worked out positively. The sunset is anyway a perfect time to shoot silhouette photo’s, with the village in the background. The feeding in the morning is done within the village. A special feeding ground has been created and we were invited by a local to photograph from his roof terrace, offering unique opprtunities. 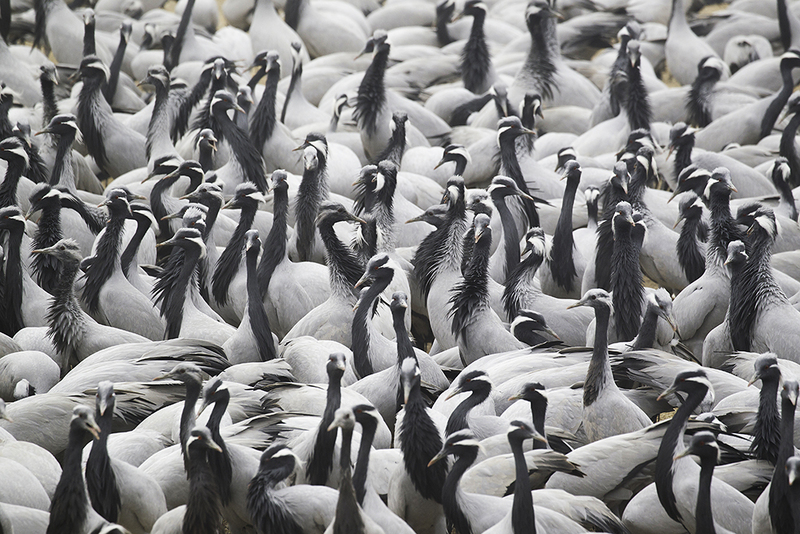 The spot is best to Identify by the large flocks that fly around. The feeding is organised by a number of people and sponsorde by Jains living in India and abroad. 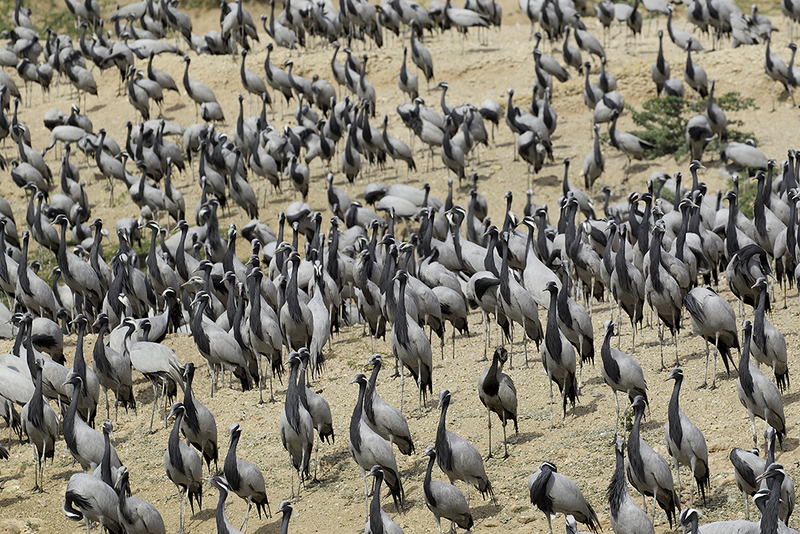 The hospitality was great and we were shown articles and rewards about the work done to ensure a great future for the Demoiselle Cranes. 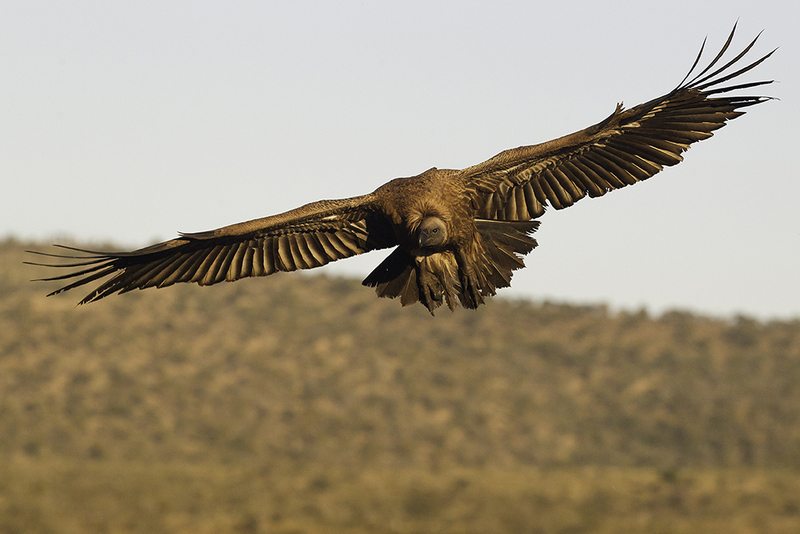 Important has been the work to ban electricity poles close to the feeding grounds. In Juli 2018 I visited the Zimanaga Private Game Reserve. The trip was booked via Wildpix Travel. I have done trips with them before to Spain (Vultures), Sweden (Golden Eagle in the snow), Romania (Ultima Frontiera) and Hungary (Bencé Maté). During the trip to Bencé, I learned about his involvement with Zimanga and the photography hides he helped to create. 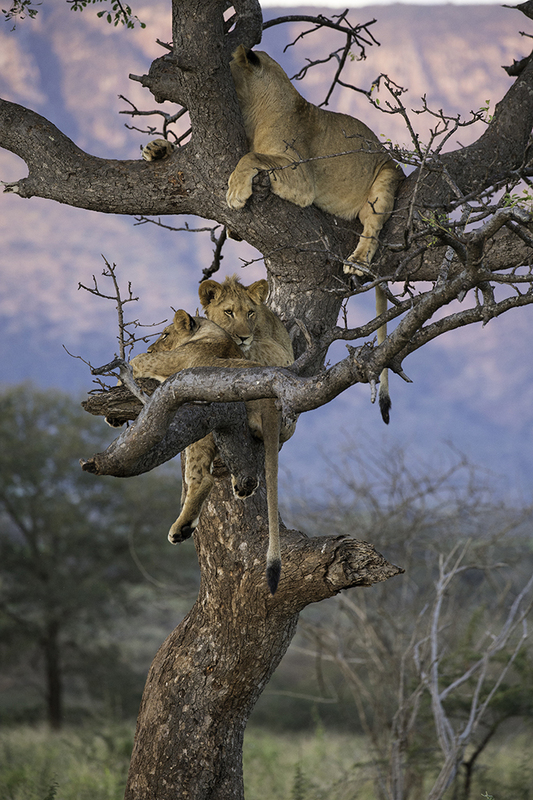 Knowing his focus on creating optimal photographic conditions I was convinced that, as a safarilover, I should go there. 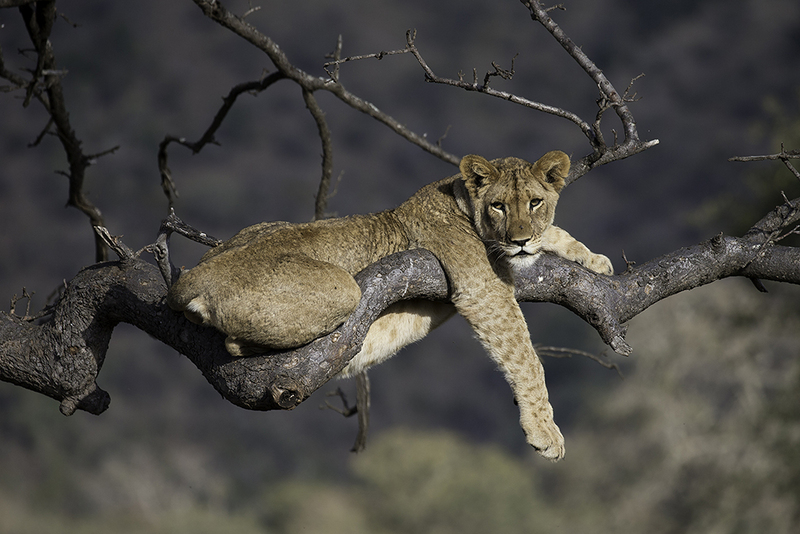 With high expectations, I waited in Durban Airport on the other guests of Wildpix Travel to go together to Zimanga. The drive is between 3 and 4 hours dependent on the traffic. 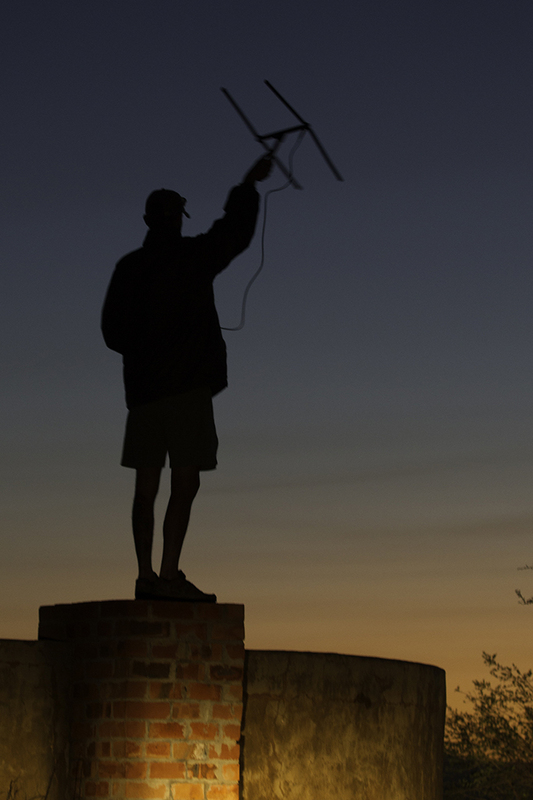 As they were late, due to missed flights, we arrived after dark in Zimanga. Even before we arrived at the lodge we saw a group of five Lions passing by. After dinner, which like all meals at the lodge, was great, we were informed of the groups and the program for the coming 9 days. We had a group of three and I was lucky to have two photographers with largely the same mindset in my small group. Our guide was Jono. He is extremely well informed about the bush, but also showed a great understanding of the photographic opportunities and challenges. This proved quite vital for the success of the week! We stayed in the main lodge. It has fantastic rooms with for example ample space to load batteries, do photo editing and enjoy the beautiful view on the reserve. The experience is pure luxury, but less of a real bush experience. No dust, no sounds of nature during the night and showering inside. As the lodge is fenced you can safely walk to your room after dinner, without a guide accompanying you. Before the morning activity, you can eat some yoghurt or a muffin, and have coffee or tea. Morning drives started at 6 o’clock, at this time of the year. You either had a hide session or a gamedrive. First the guests for the hide would be brought to their hide and then the gamedrive would start. At the end of the gamedrive the guests at the hide were picked up and brought to the lodge for breakfast. This limits the time available for the game drives to three hours. 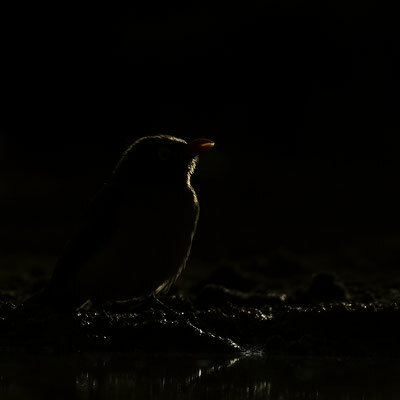 Pitty in case you see something special, but as photography is the main idea of the reserve, not a real issue as already after two hours one has less favourable light. Lunch was served at 13 o’clock and was light and nice. One hour later the afternoon program started. This was similar to the morning program. Dinner was served around 18.30 and this offered the opportunity to do some photo editing in the evening. Or to go to bed in time! 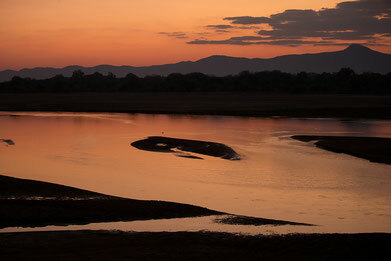 Not a real luxury as the Zimanga Game Reserve also opportunities to photograph at night from the two overnight hides. 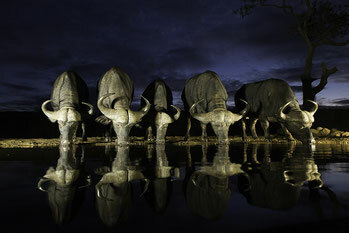 Great opportunities to photograph Elephants, Buffalo’s, Hyena’s and other animals active in the night. 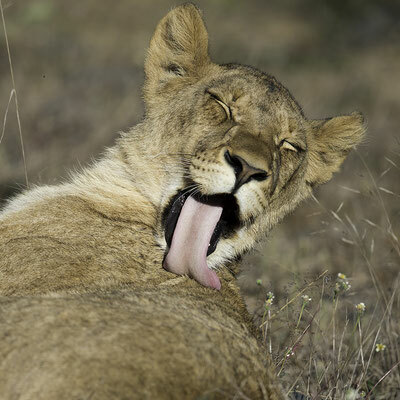 For example during one session a Lion was photographed, while drinking at night. During the 9 days stay we could photograph twice from both hides. A unique opportunity! 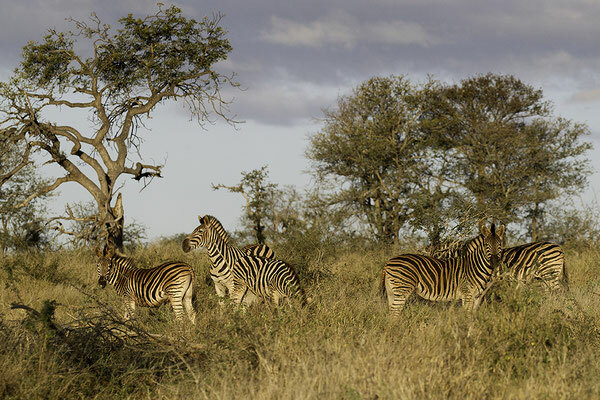 The gamedrives in Zimanga differ in some aspects from normal game drives in most other game reserves. The first difference is the focus on photography versus tracking and finding animals. Key species like Lions, Rhino’s and Cheetah have a chip and can be tracked relatively easy. The second difference is that the time at a sighting is not limited as a result of new vehicles arriving. With three vehicles only in use during our presence we never had to go away to create room for others. The third difference is that each photographer has in principle one row and is able to photograph from both sides of the vehicle. 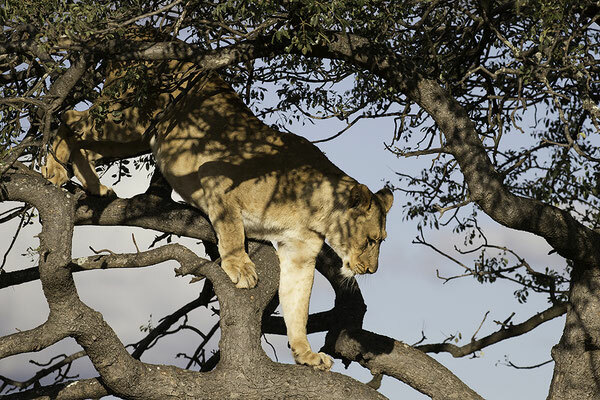 The fourth difference is that the guide positions the vehicle at a sighting with the photographic opportunities in mind. But still the guides are dependent on the co-operation of nature and wildlife. 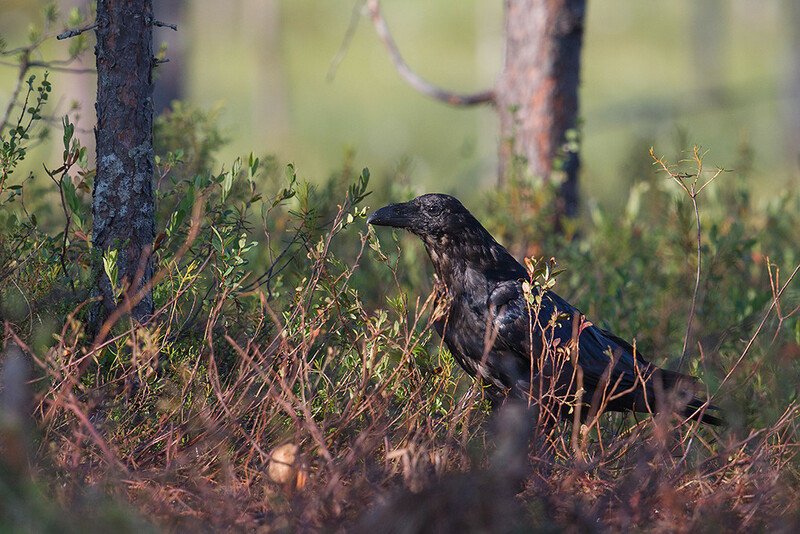 For example we started with rather cold and windy weather, which restricted the sightings in the first days as many animals stayed in the bushes. 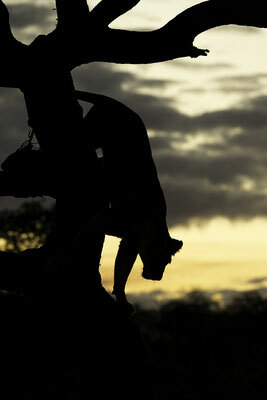 And although the reserve is fenced the group of Wild Dogs has escaped for the second time and was not at the reserve. Also we did not see a Leopard, although we saw their footprints. 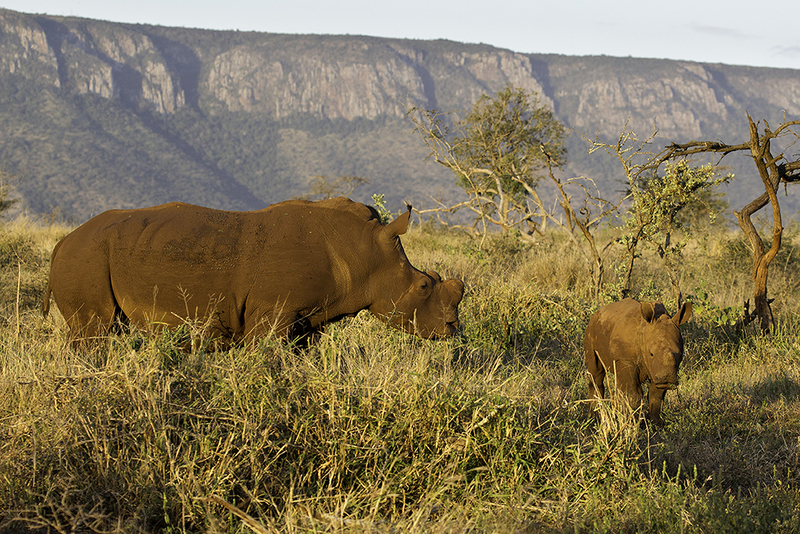 In order to further improve the photographic opportunities the reserve is still investing. New land was acquired and added to the reserve recently. The main benefit will be that the reserve can service larger groups of antilope etc and as a result more predators. 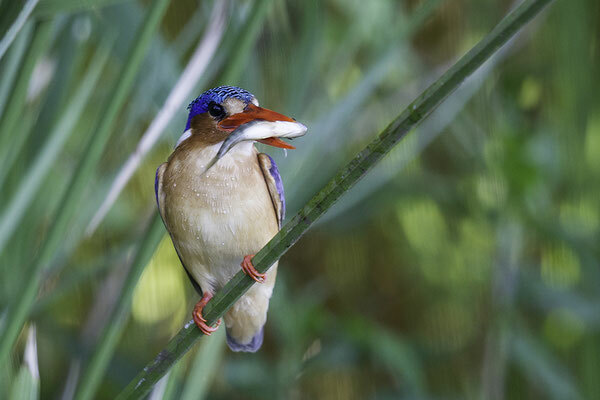 An other main investment was done in the second overnight hide. 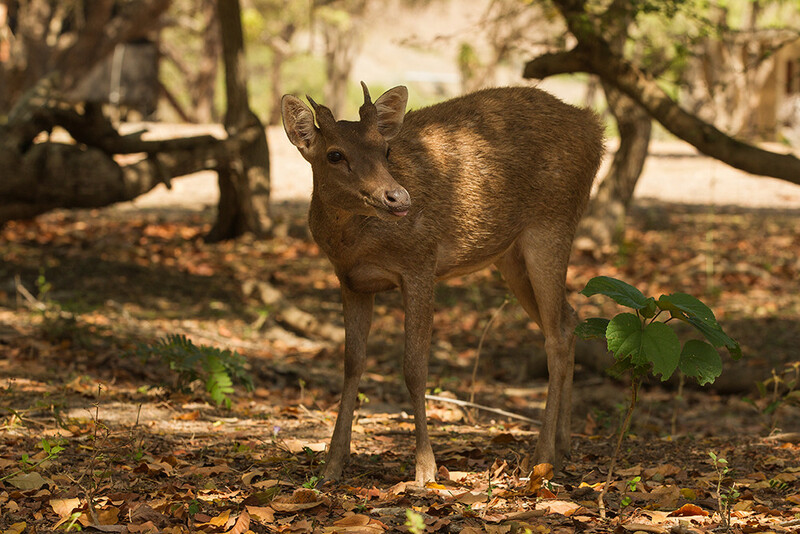 The hides are another key attraction for the reserve. Bencé Maté has supported the development of the different hides. The overnight hides are luxurious and have beds, and a small kitchen. But more important they are build with photography in mind. 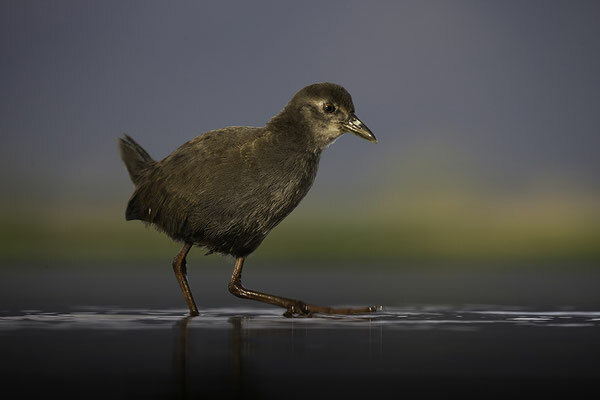 No miracle that Bencé has made some of his fantastic pictures from the hides. As always with his hides the background has been carefully chosen and helps to create great photo opportunities. 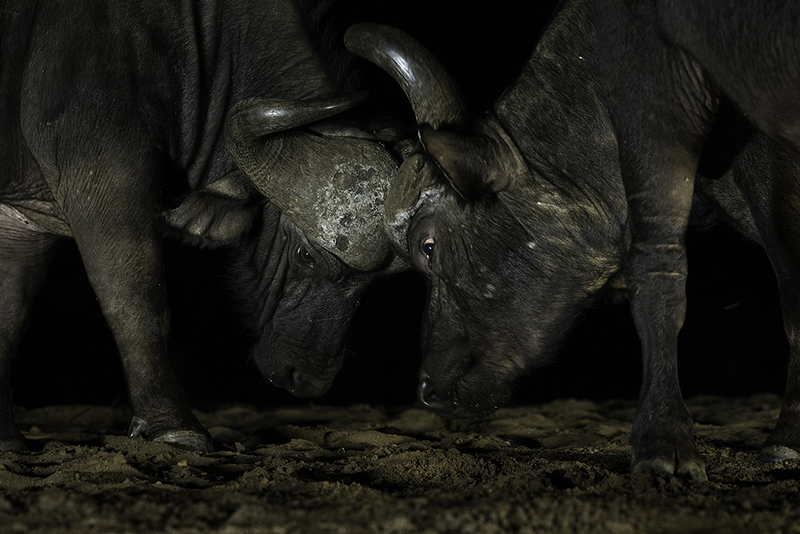 Umgodi is the oldest overnight hide. It has 4 comfortable seats and for each photographer a tripod, ready for use, is available. The hide has mirror glass and a light set up, helping you to photograph during the dark hours. The lens most used will be your wide angel lens (as I used) or a 24-70 mm lens. For details I also used my 70-200 mm lens. The lens has to be capable to deal with the difficult circumstances. Mine all were f2.8. Most pictures I took I still need ISO 3200 in order to avoid motion blur. For the afternoon a sun lenscover is essential as lens flares are easy to get. All material can cause reflections, so one has to wear dark cloth and put tape on camera and lens names. 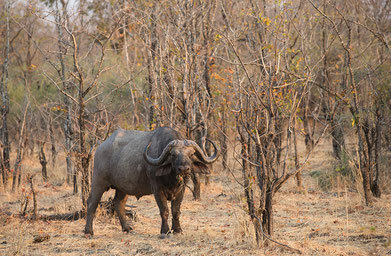 We saw Buffalo’s, Elephant, Nyala, Kudu and Warthog. As the lights are on I could not get images with long exposure of the sky with stars and the moon. This created some problems, as I had the idea to make a multiple exposure composed of a long exposure and a short exposure of an animal coming to drink. I tried to make multiple exposure pictures with the three at the setting, by creating a filter with my black gloves over the parts that would be getting enough light at the short exposure, when a buffalo came to drink. The results are not yet satisfactory. But I’m sure that with more efforts and time I could get it right. 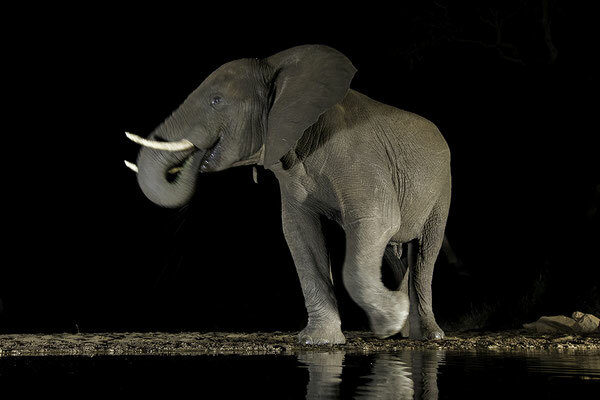 Tamboti is the new overnight hide. It is only in use since May 2018. 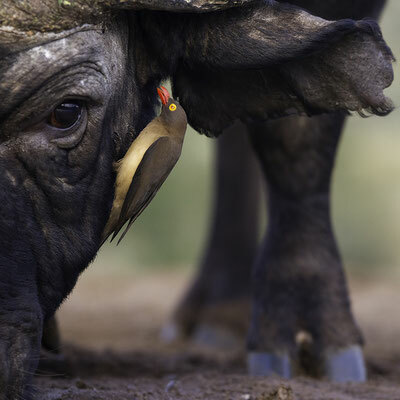 It works in the same way as the Umgodi overnight hide. 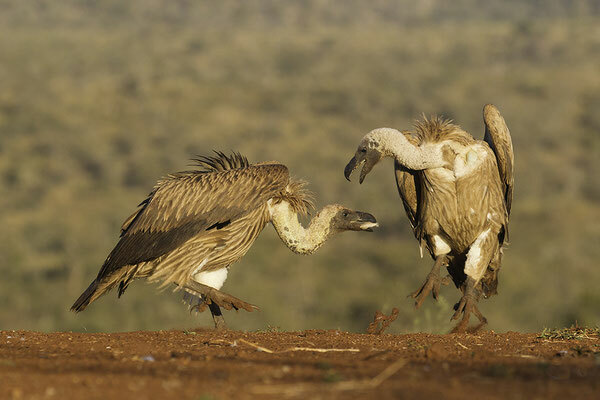 A difference is that during the afternoon part of the session food is provided for Vultures and Tawny Eagles. We also could photograph Marabou Storks and Wooly-necked Storks. 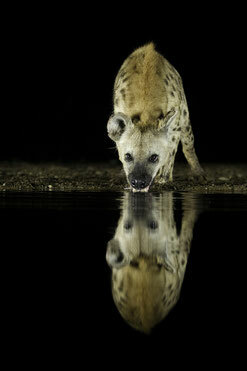 As some remains were left for the night the Hyena appeared both nights. The first night it didn’t come to drink, but the second night the Hyena came to drink. Our first night was disappointing, as the activity was limited to SpringHare , mice and a Grasshopper. 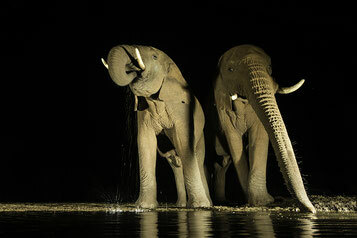 But the second night we had two Elephants coming to drink, which was fantastic. 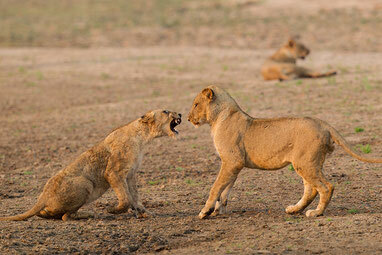 The group of 2 female lions and their nearly one year old cubs had made a kill close by, could have easily come for a drink, but did not appear. 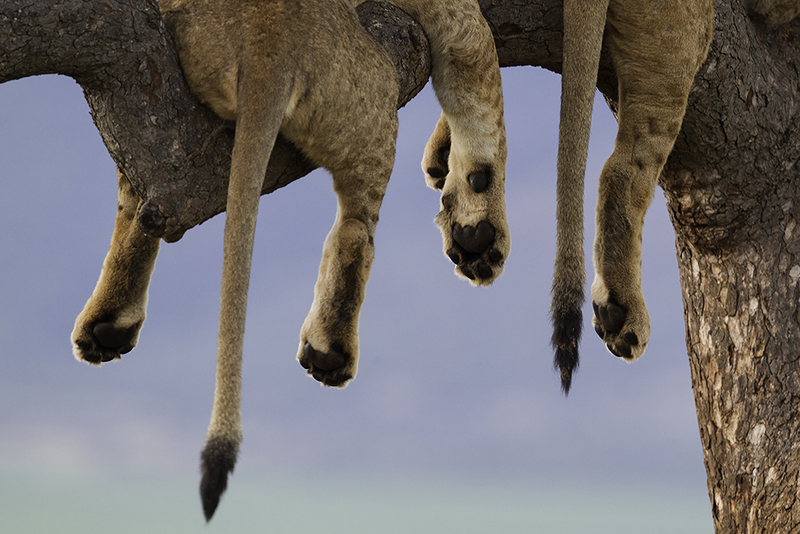 The best positions are in the middle, especially in case the animals are on one of the side positions. 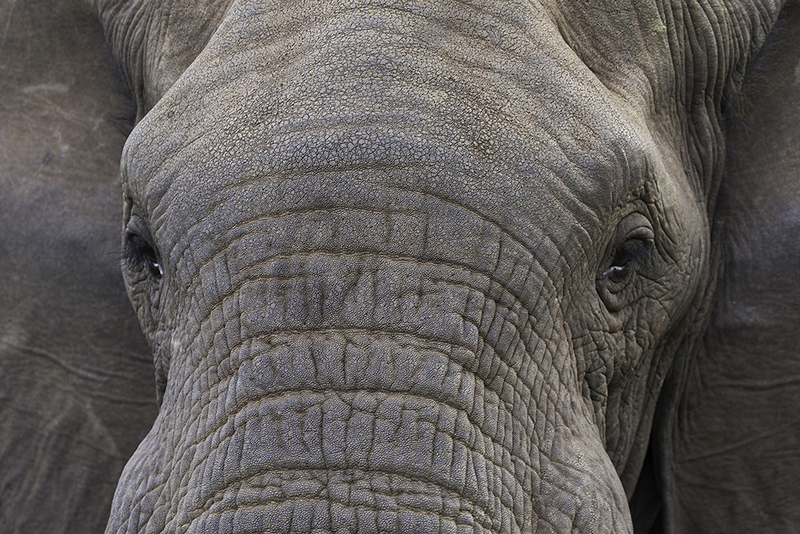 I had the Elephants in front of me sitting at the right side, but had to remove the light blocking panel by editing. Still the results can be great as shown in the picture above. I strongly believe that this hide will soon become popular, as also Leopard is in the area and as the night camera’s have shown its presence on some nights. We used only one of the two drinking hides. 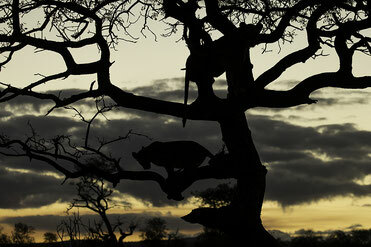 Reason was that the second hide didn't produce great image earlier that week and that we preferred an extra gamedrive. The focus area for photographing is limited. With four persons it is rather small. Especially in the middle you will have to deal with the airco, blowing heavily on to your head and neck. 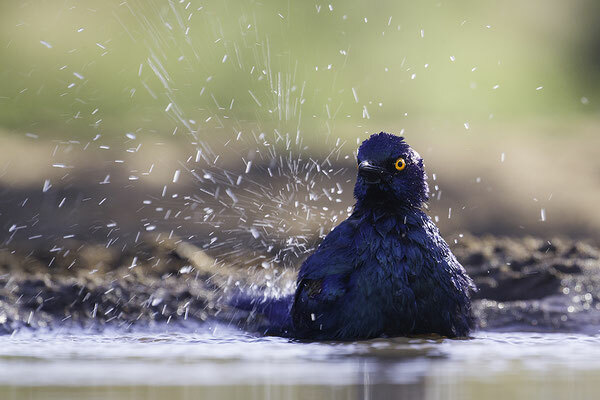 As long as it is dry the bird activity is good. We had in one morning around 15 species, but unfortunately nothing special. Personally I used both my 500 mm lens and a 100-400 mm lens. On the sides some seeds were fed to the birds, but as the sides are from concrete the setting doesn’t help for great photo’s. 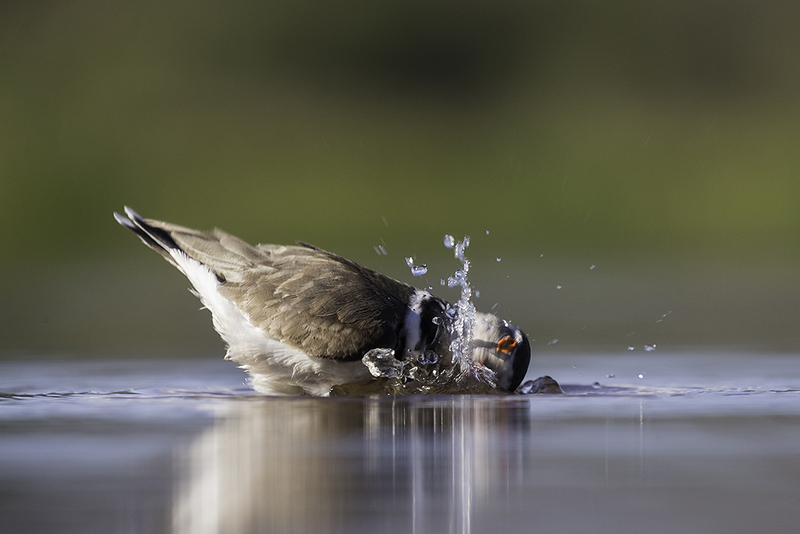 The background for the drinking and bathing is though as good as one can get it! It shows the impact of the support by Bencé Maté. The Lagoon Hide is having water on both sides. As a result it can be used both in the morning and in the afternoon. even more opportunities exist when backlight is considered as an option! The background in the afternoon session are the mountains. 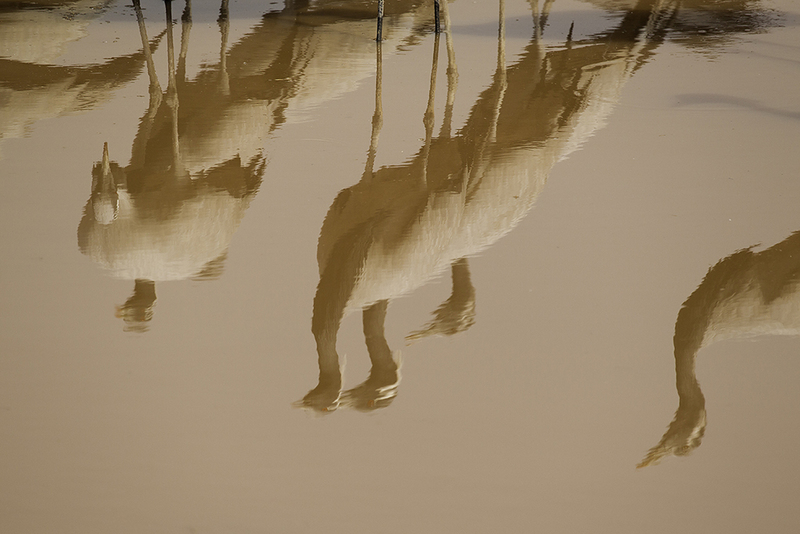 It is very important to lower the tripod to a level that the background is not having a red row as a result of the red sand at the end of the lake. Again I used the 500 mm lens as well as the 100-400 lens. 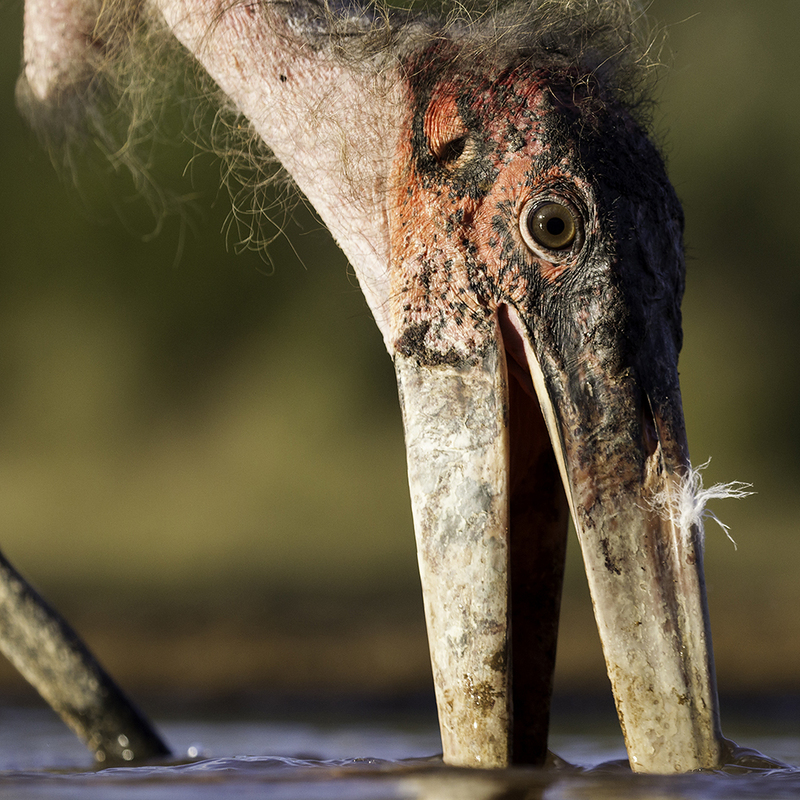 Great opportunities existed to photograph birds extremely close. 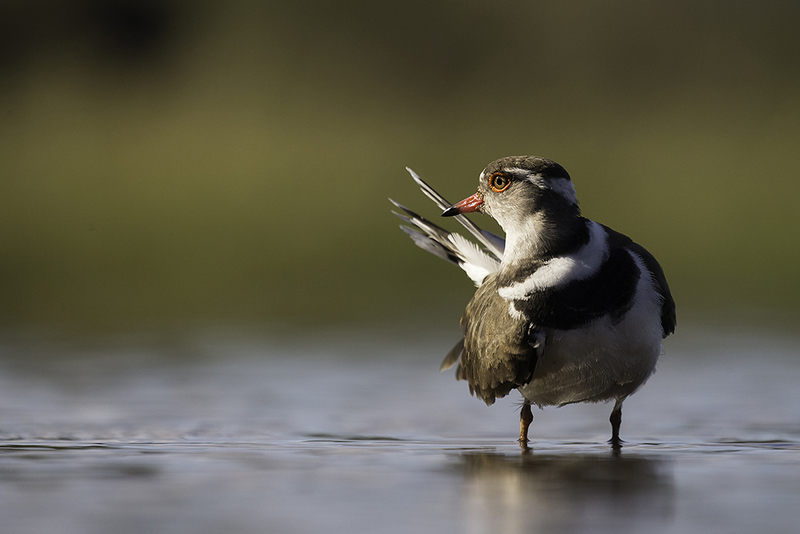 For example a Three-Banded Plover came to bath at only two metres! 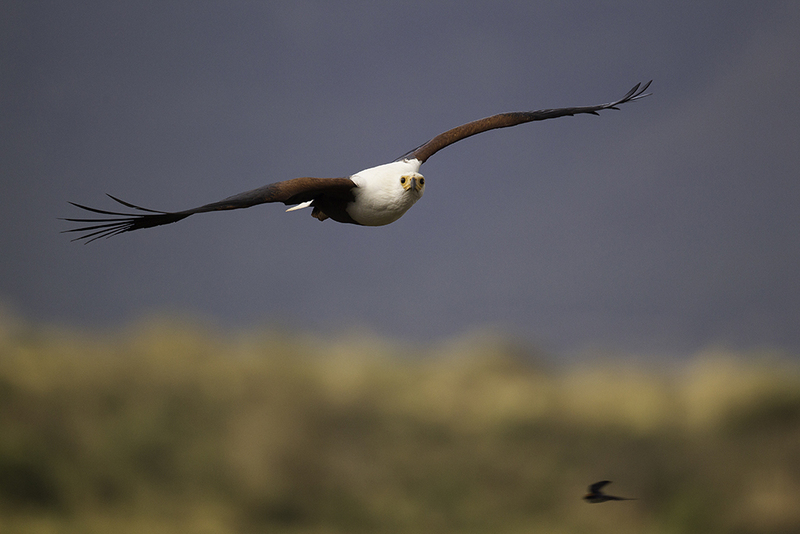 Given the mirror glass we had some difficulties with the African Fish Eagle. 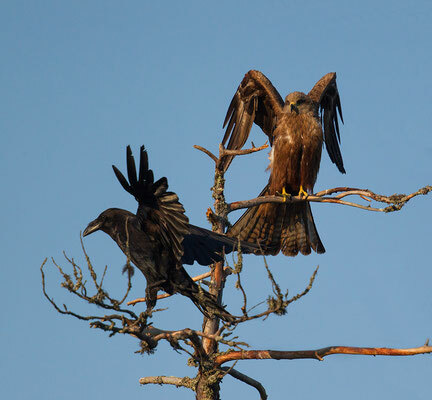 The Eagle believed he faced an opponent in the mirror and given the fact that it was waiting season decided to defend his territorium. This resulted in clashes into the window. By putting the window in an angle and lowering the front cover we largely solved the problem. One has tough to be more quite. Still it is one of my favourite hides. 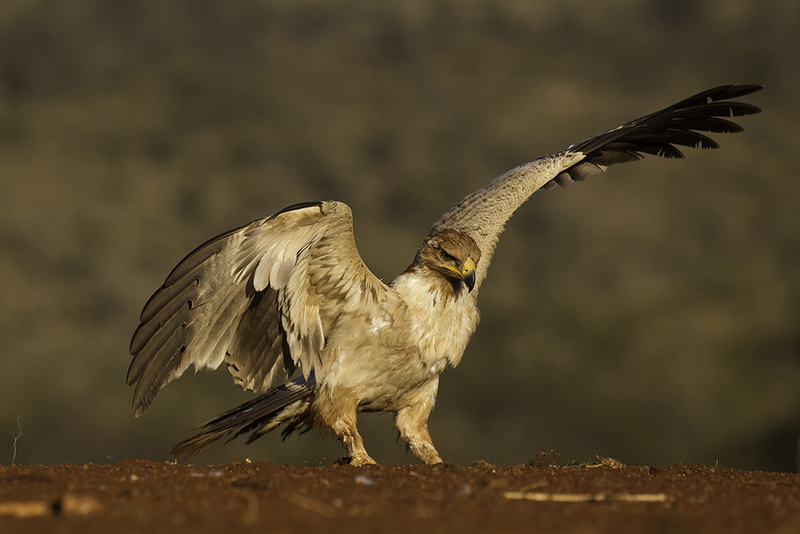 The Scavenger Hills Hide aims to offer opportunities to photograph different Vulture Species. Initially the hide was only operational in case natural food was available. As this has also the disadvantage of having bones etc on the picture, it was decided to feed intestines. 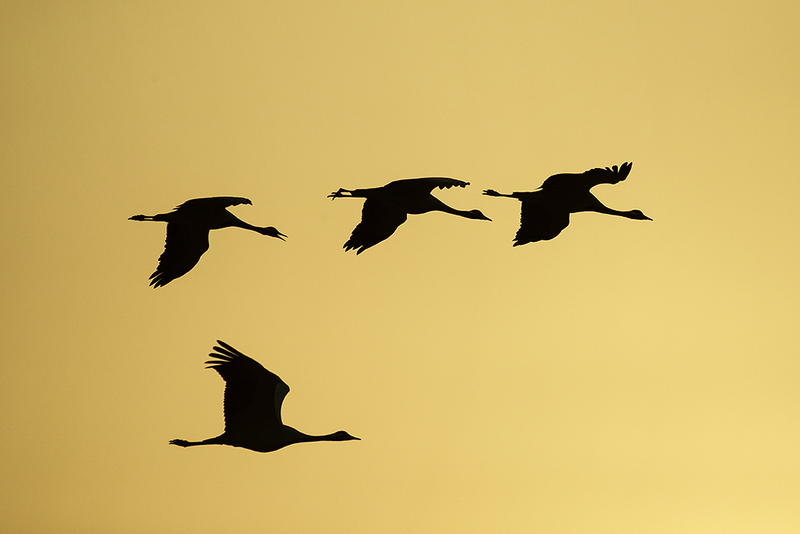 Still they appear on some of the pictures, but at least it ensures that the hide can be operated every morning. 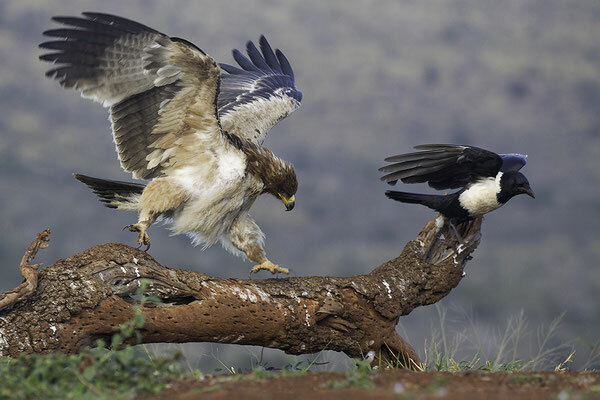 We had only White Backed Vultures, Tawny Eagles and Pied Crows on the side. A Lapet Faced Vulture stayed in a tree nearby. As the number of White Backed Vultures was quite large I found it difficult to photograph some of the interactions. Still I got some nice pictures as the light was part of the morning really superb. The lens I missed most was a 24-70 mm. I did not bring it as mine crashed just before we left home. The lens I used the least was remarkably the 500 mm lens. If I had to decide , which one I wouldn't take with me a next time it would be this one. Main restriction would be the difficulty to photograph smaller birdlife. 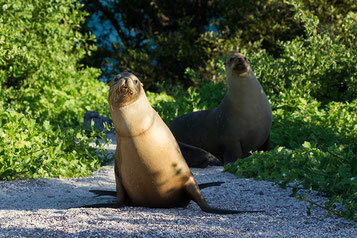 We recently visited the Galápagos Islands. Probably every nature photographers dream. At least it was mine. It really proved worth every penny spent. During both weeks which we had arranged through a dutch travel agency we enjoyed nature. The first week was spend on a sailing boat called "tThe Beagle" and the second week on the boat called "Natural Paradise". The second one was clearly more luxurious, had a tremendous guide called Peter, but the disadvantage of more guests and slightly later starts in the morning. The days at the Beagle started earlier, the group was smaller, but our cabin rather small and the guide was more into diving and snorkeling with sharks, the into birdlife. The page I wrote about the Galápagos trip could not contain all the pictures I wanted to show. So contrary to what I normally do I created extra sub pages for the Photographs of Birds, Marine Mammals, Reptiles, Landscapes and so on. In September 2016 we went to South Luangwa National Park in Zambi, where we arrived after a long trip from Amsterdam via Nairobi and Lusaka. . After being picked up at the Mfuwe airport, we drove 45 minutes to our first lodge the Mfuwe Lodge of the Bushcamp Company. In the afternoon we made our first drive and immediately enjoyed the scenery and the wildlife. As hoped we saw Puku, which for us was a first timer. 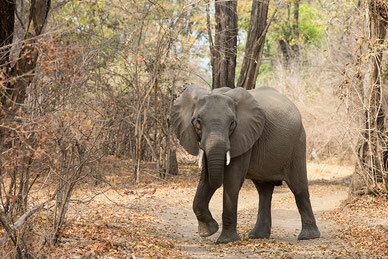 Later in the week we realized it was quite normal in south Luangwa. During the drive we also encountered for the first time this week the albino Lion. Back in the camp we enjoyed our dinner. Food proved to be very good in both lodges in which we stayed. During dinner we agreed to wake up very early the next morning, in order to be out when the sun rises. 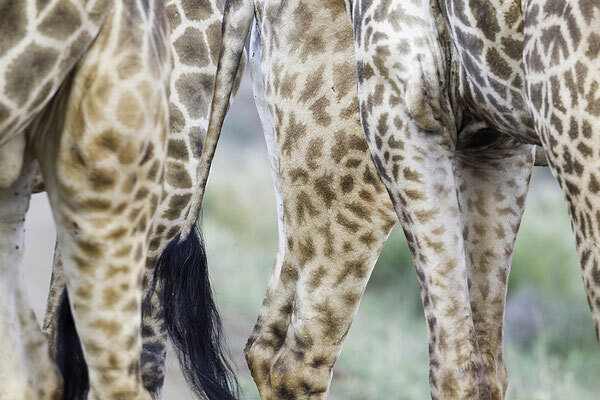 This is one of our best practices learnt during earlier safari's. For photographers light is essential and early morning light is our favorite. The primary target for the next morning drive was a group of Wild Dogs. We didn't find them. Still we had a great morning drive. 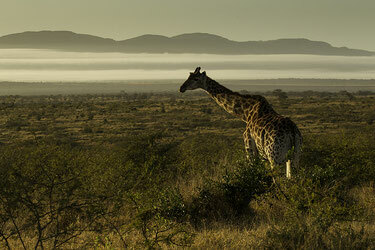 Beautiful landscapes and a rich wildlife. We took some time to photograph the Thornicroft Giraffe from a low position, by placing the car in a lower passage in the field (see pictures on my Zambia page). Next stop was at Carmine Bee-eaters, which I tried to photograph in flight. This proofed to be difficult. I tried it also later in the week, but wasn't very successful, so we have a great reason to come back! From the edge of the river, we could see a group of elephants coming to the river. They first went for a drink. Quickly Famuel, our great guide, took us to a spot, where we could photograph a potential crossing. Luckily the elephants decided to cross the river at this point. After we moved to a slightly better spot to photograph I took the picture, shown here. After this moment we went on to see a lioness, which was resting a little further on. 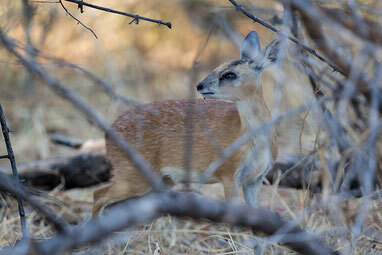 She gave us the chance to take some pictures and moved on deeper into the bush. We decided to go back as the light had become harsh and as I was recovering from illness the week before. At 10 o'clock we were back in camp and took a massage to further relax. After the early lunch we went to our lodge, with a beautiful view on the large pond with hippo's and crocodiles in front of the camp. The afternoon drive was a spectacular one. Quite early Famuel was informed about a group of six lions, quite far away. We decided to try to be there as first group. We managed to find them around 17.30. they are laying down close to the river and seemed to wake up. One of the lions clearly wasn't feeling very well and gave up food. When they started to play little bit, some of them proved to be quite grumpy. They became quite aggressive as shown on the pictures. At such moments it becomes clear, how even during playing time the hierarchy in the group is established. We left the spot to gradually move back to the lodge. During the sundowner, Famuel saw quite far away another group of 11 lions coming to the riverside. We quickly went back into the car and went to see the group. As it had become dark I had to practice photography in the dark with the help of the light. I wrote a blog with pictures about it (in Dutch unfortunately), where I explain the techniques used. On our way back to the lodge we saw Leopard and like the day before a baby Porcupine. The next morning we left a little later than usual, as we had to drive to our next camp, the Bilimungwe Bushcamp. It is a three hours drive through beautiful and changing scenery with abundant wildlife. 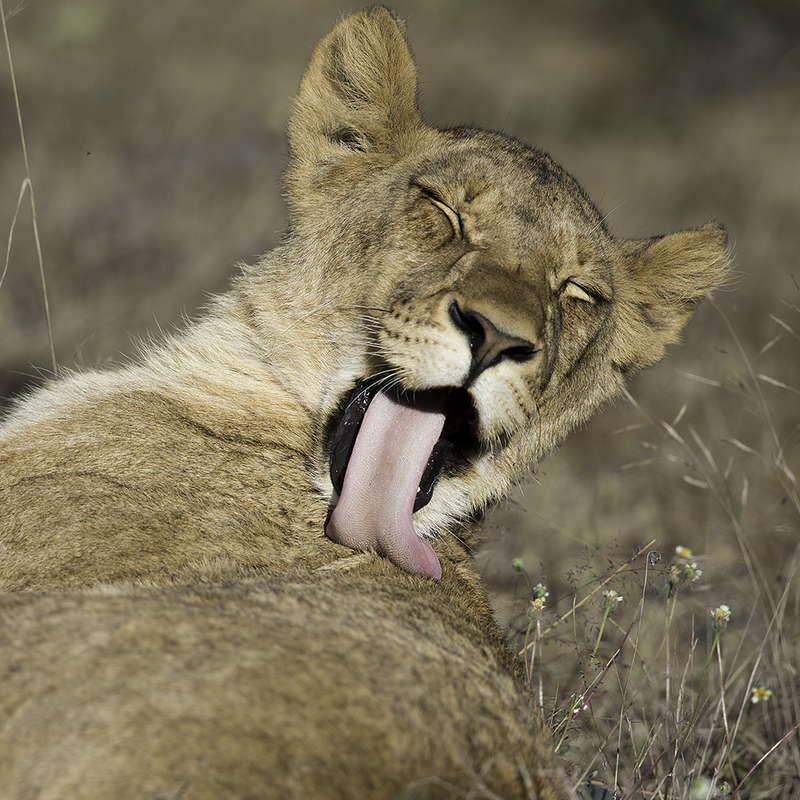 We really enjoyed it and saw on our way several lions, antilopes and birds. We also encountered the elephant shown on the picture. 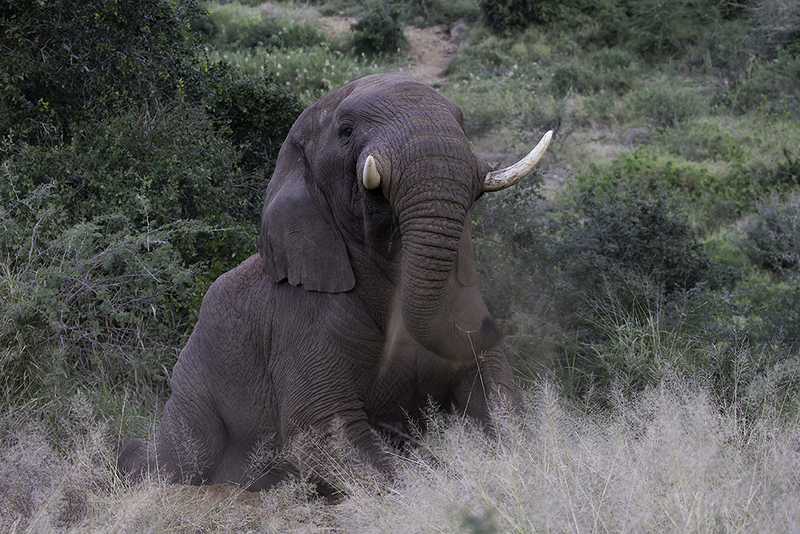 As the elephant had decided that the food was great at this spot, we had to wait till the meal was finished. Still we arrived in Bilimungwe in time for lunch. The camp is a real bush camp and has only four tents. Each tent has a pont in front. 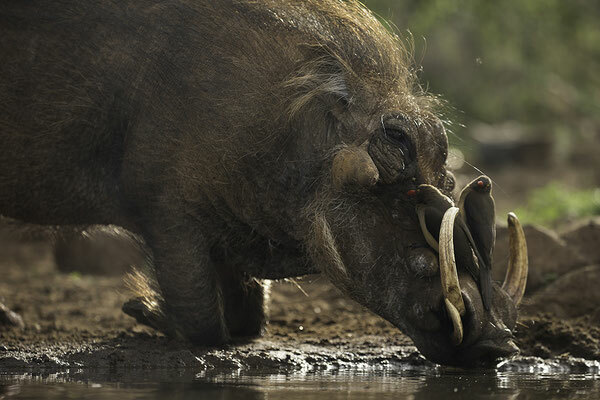 From the veranda we saw the coming days, Bushbuck, Impala's, Baboons, Elephants, Kudu's and Warthogs coming to drink. This gives a real feeling of living and being in the bush. So after lunch we took a shower and enjoyed the views and took a rest, as the temperature was above 30 degrees celsius. The surroundings of the lodge were quite dry during our stay. The river had dried up and open fields with wildfile gave beautiful views. Of course we continued our safari drives in the afternoon and the following days. I could write long stories about them, as all of them were great and some even spectacular. The photographs made are always a good proof. Half an hour later only some small remains can be seen. At that time we were already out in the field. 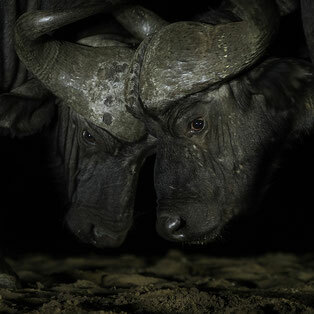 With still beautiful light as shown in the Buffalo picture at the beginning of the post. One afternoon we went out again a little earlier as we hoped to find a Leopard a little further away. 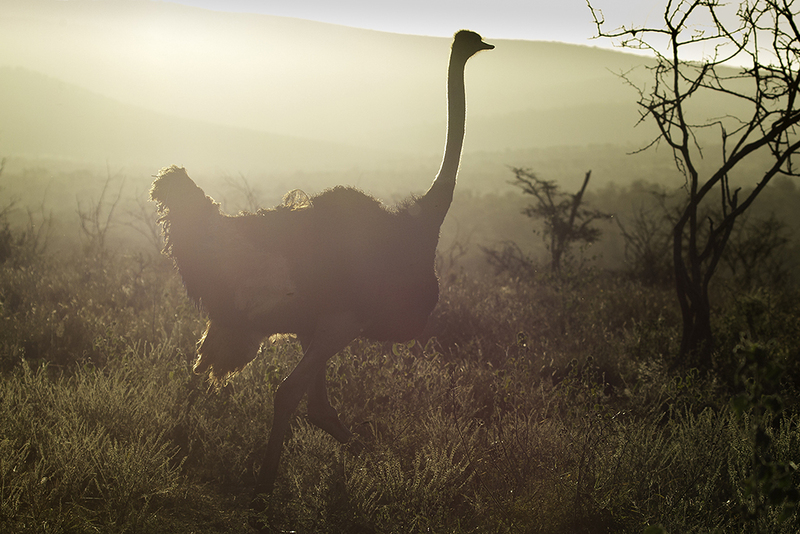 We were lucky to encounter the one on the picture. It was sitting in the field and seemed to have just started a hunt. We were looking to find the prey and saw a Sharpe's Grijsbok in the bushes. 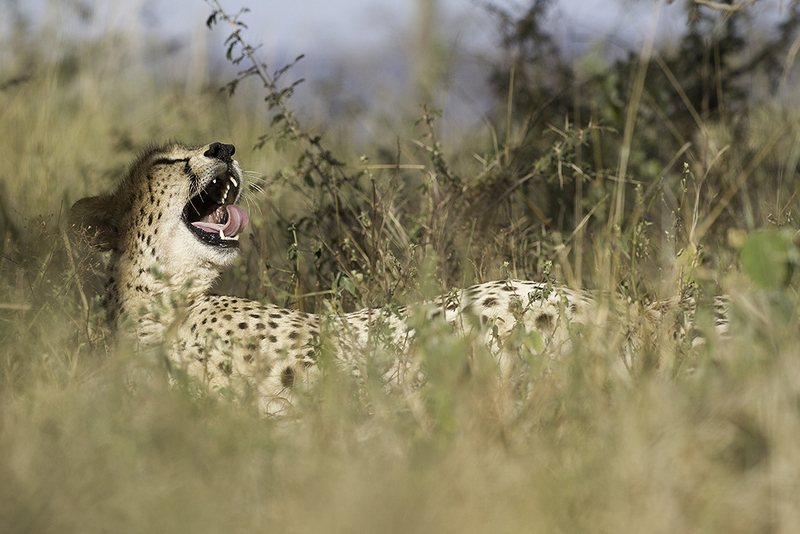 The hunt was not immediately successful as the Grijsbok saw the Leopard coming. The Grijsbok ran away and together with Famuel, we decided to keep following the Leopard. We nearly lost sight of her end took the risk of totally loosing sight by driving around to a better spot. She nicely waited for us and when a second vehicle moved closer by she started her hunt again. 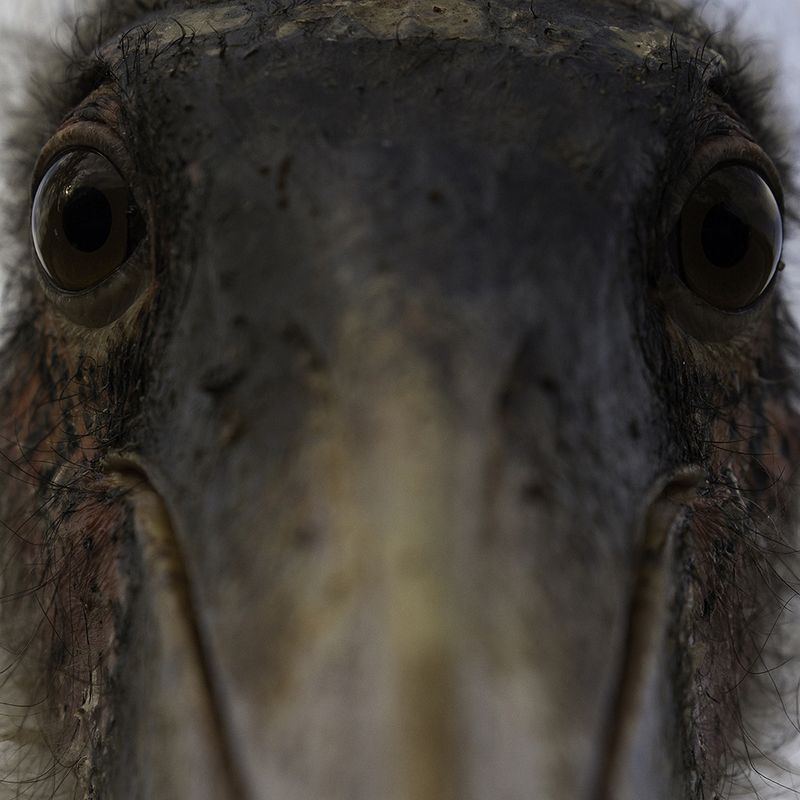 Resulting in the fact that the picture of the Grijsbok is the last one taken of it alive. Much to our surprise she didn't start eating, but first cleaned herself, than walked of for a drink. After drinking we heard her calling. The conclusion was that she called a cub. 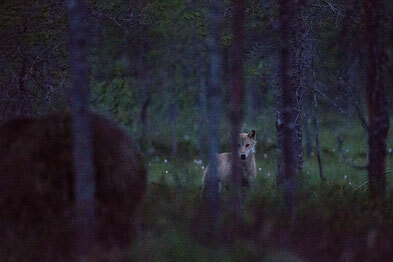 When it had become dark, she appeared again at the waterside together with the cub. The cub went for a drink as well. 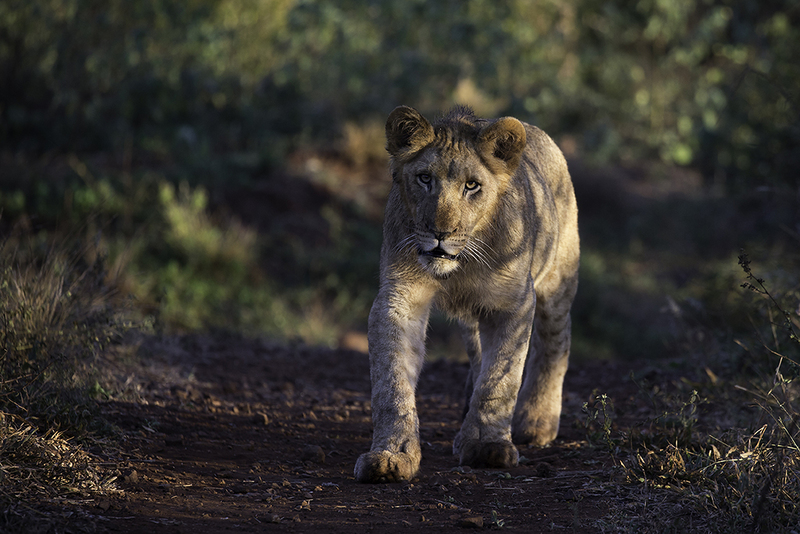 They continued their walk to the kill and after the mother had made sure there was no danger the cub appeared at the prey. Still no eating. The cub was first trained to ten the prey to a tree. 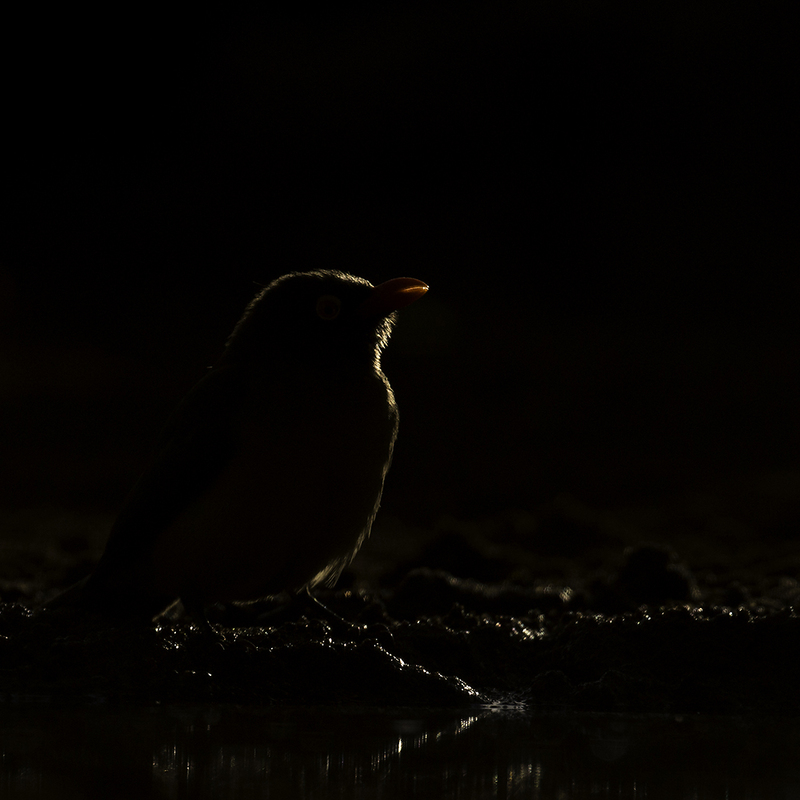 The pictures in the dark aren't great, but you can see them at the end of the blog I wrote about this spectacular encounter. This all happened during our last afternoon in Bilimungwe. 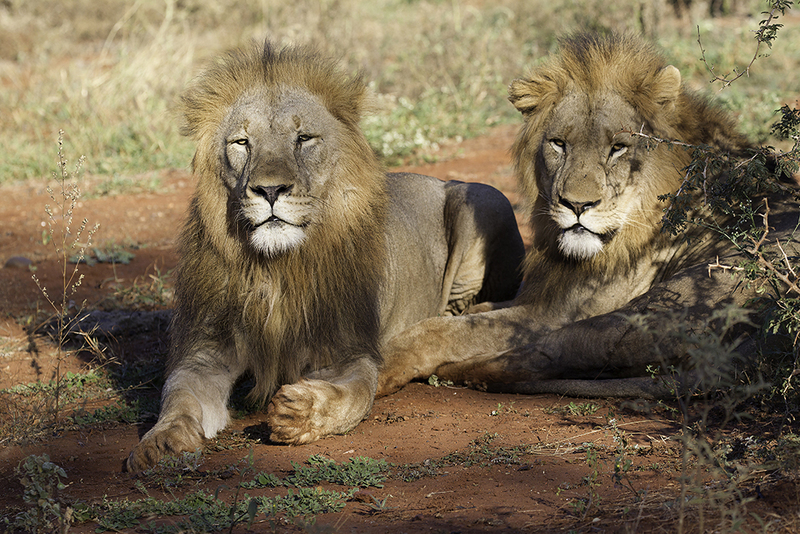 The next morning we enjoyed our last drive with lions. 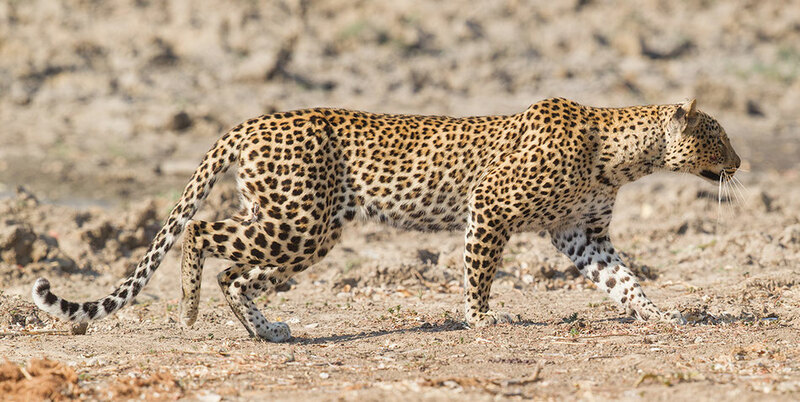 leopard and all the other wildlife of South Luangwa. 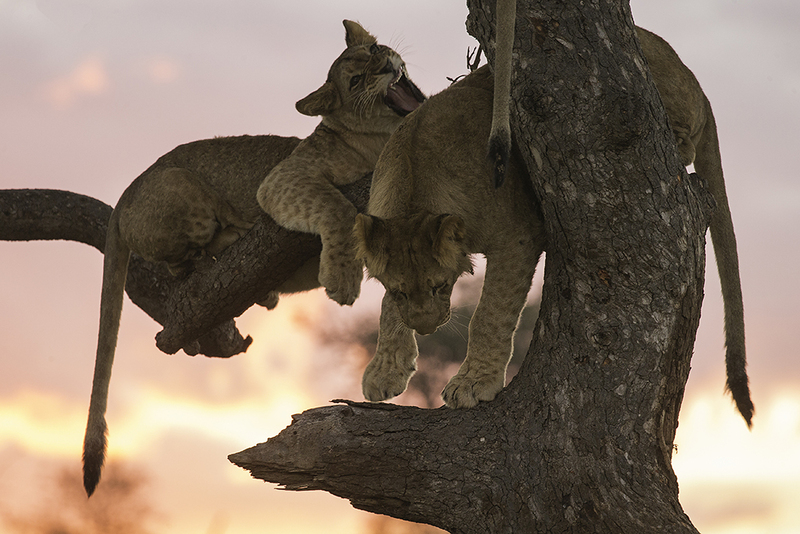 You can see more pictures at my Zambia page. Recently we went for a trip to Indonesia. 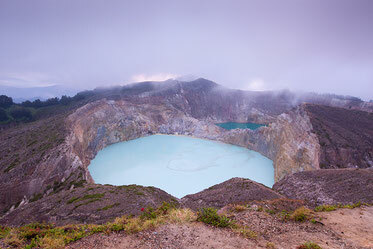 We planned to visit Bali for a few days, followed by a trip over the island Flores and some days Lombok. I intended to bring my 500 mm lens with the heavy tripod needed to support the lens. But one week before we departed I had another treatment for my Frozen Shoulder, so it wasn't very smart to take the heavy stuff with me. With pain in my heart I decided to leave it home and take only my smaller Canon stuff and the Olympus system camera with the Panasonic 100-300 mm lens. This allows me to take at least some bird pictures. When we arrived on Bali we went on to Sanur in the south. Next morning I woke up early to see what birds and other topics I could photograph on the beach. Although quite early it was already quite busy and I couldn't find birds to photograph. So I focussed on the sunrise. 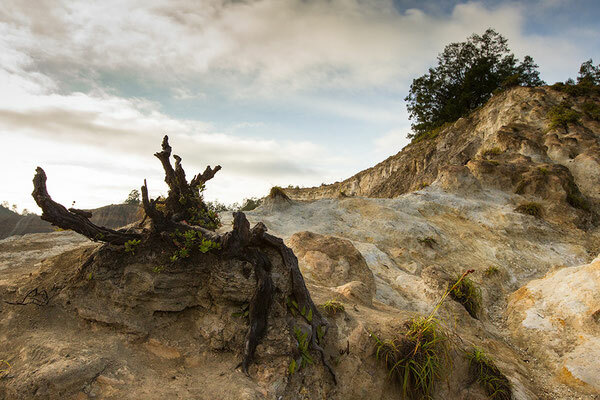 During our walks in the morning and afternoon we weren't impressed by the nature in this part of Bali. Also our trip on the second day to Ulu Wattu did not the deliver great nature pictures. 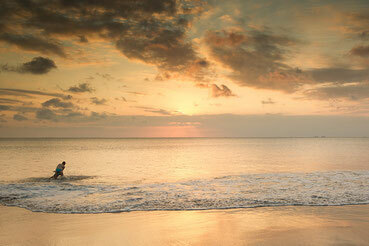 In the evening we went to Jimbaran and enjoyed a beautiful sunset and a great meal of fresh fish! 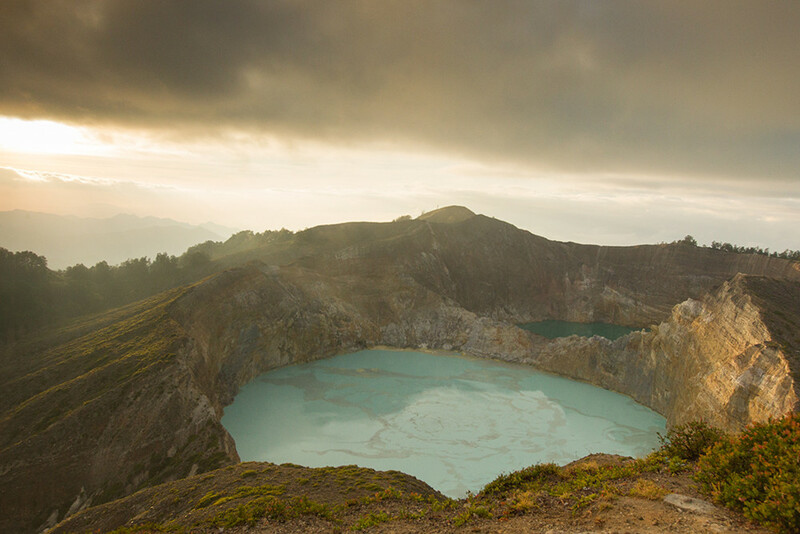 Next day we flew to Flores. This island is far less touristic and we hoped to encounter more nature. We drove from Ende to Moni by car and got stopped after 40 minutes. Roadworks were done to broaden the road and a dragline worked hard to remove part of the mountain. The road was blocked by the remains and rubbish of the mountain and we wondered what would be done to remove it. It was actually quite simple. It was pushed into the valley, not taking into account what damage it might do. A See-Eagle flew up from it's nest, which probably was destroyed. Horrible! But still to far away to photograph. At least we saw a bird. In the afternoon we arrived in Moni. We had lunch outside this small village and saw some birds at a large distance. We asked our guide why we didn't see more birds and indicated to us that any animal that moves and has some meat on the bones is hunted for. Next mourning at 4 o'clock we woke up to climb onto Mount Kelimutu, to see the sunrise. 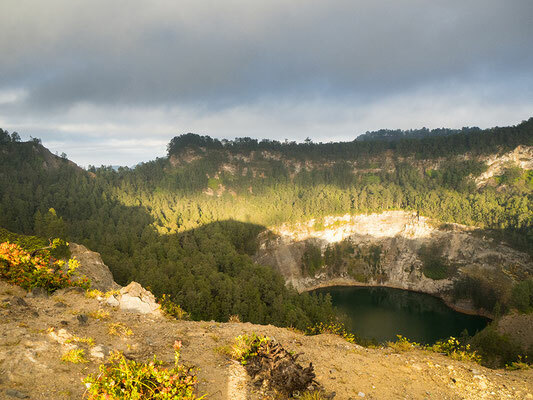 Mount Kelimutu is a volcano with three lakes, which regularly change from colour. We went up as the first, so I had enough time to set up the camera, with wide angle lens, on the tripod and install the filters, which I thought I would need. The sunrise was largely covered by the clouds, but still we had a fantastic time. High up in the mountain we also heard the sound of birds. But so far away, that we couldn't see them. The following days we travelled around the island Flores. We made some beautiful trips through rice fields without the usual cattle egrets, and mountain and volcano ranges without birds of prey. 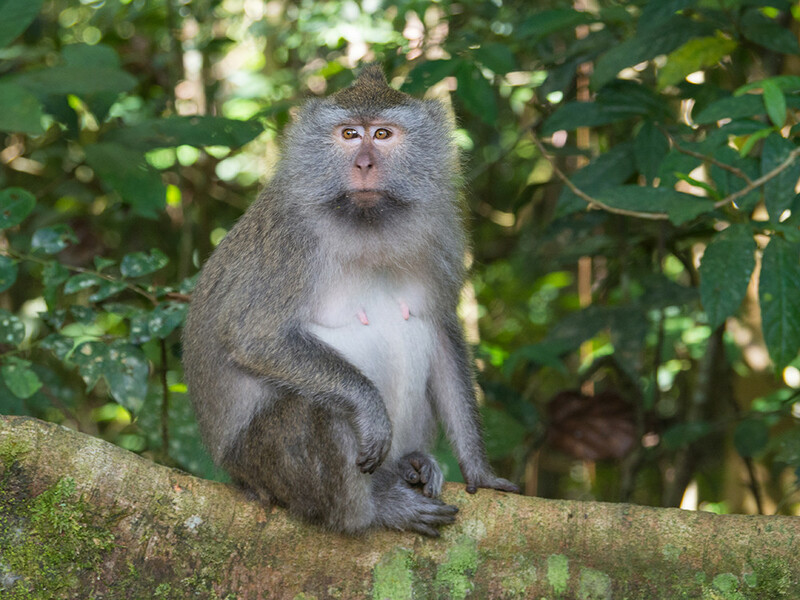 From time to time monkey and the sound of birds is what I will remember from nature on Flores. As we visited also some traditional villages I took the opportunity to photograph some children and older people. 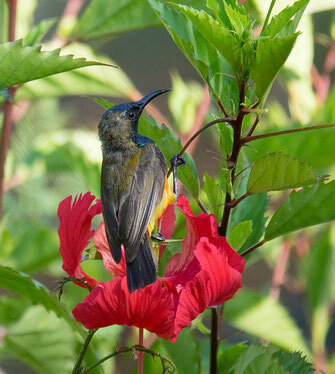 My hopes for some great nature photo's were the planned visit to the island Rinca. 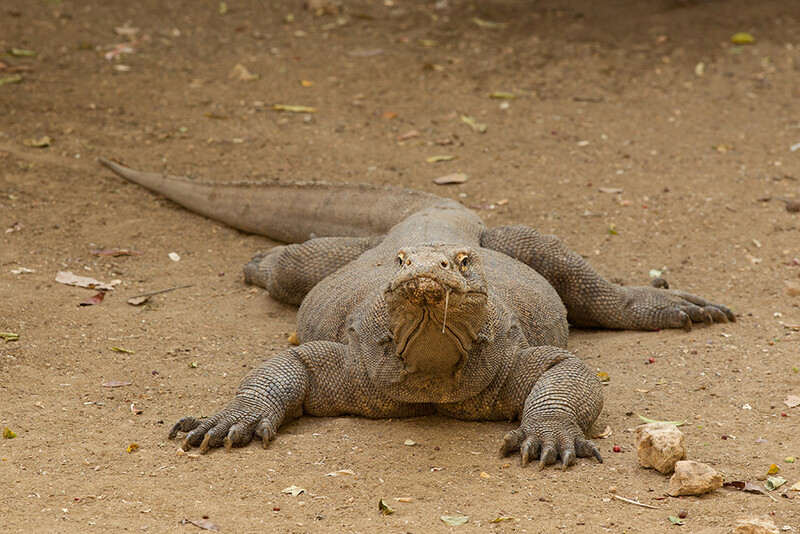 Rina and Komodo are known for the Komodo Dragon. The turgid had planned to leave at six, but as the light is already very intense quite early in the morning, we decided to go already at five. This proved to be smart. 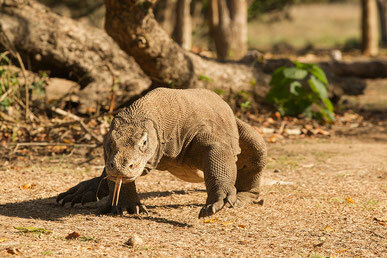 Rinca is visited by many tourists, as it is said that it is easier to see the Komodo Dragon here as in Komodo. Especially the Rangerstation is known to be a good place for seeing them. It is denied that they do feed them, but personally I have my doubts. But anyway also the bears I photographed in Finland were fed. After a highly enjoyable boat trip of 2,5 hours we arrived at Rinca. In the Mangrove woods we saw a Fish-Eagle, a Kite and several Herons. It looked like a promising day. We were among the first tourists to enter the island and were allocated a guide, who explained us the security rules. Not for nothing as the Komodo Dragon, can grow up to 3 meters, weight more than 70 kilo's and has a deadly bite. 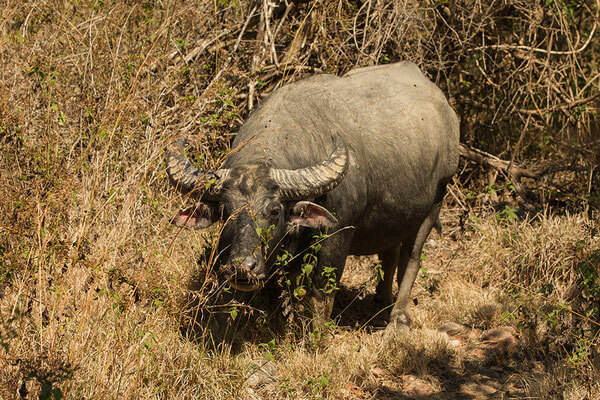 It lives from Deer, Monkeys and even the Water Buffalo. After the instruction we went on the move. 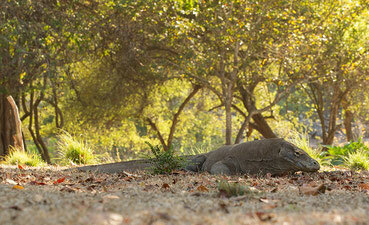 Close to the Rangerstation we found a Komodo Dragon still laying down. Gradually he became active. Photographing them while laying on the ground gives the opportunity to create nice pictures. But it isn't always a comfortable feeling, although the guide protected me with a stick with a V form at the end. We continued our search and walked into the woods. Soon we found a Komodo Dragon, digging for the eggs of a Orange Footed Scrubfowl. 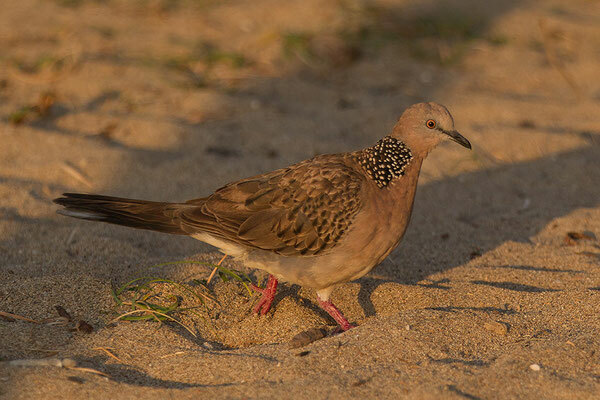 The bird tried to stop him by throwing sand back into the hole. A little further a Komodo Dragon walked the pathway in our direction. The guide directed us to the side. It came closer and closer, while I took pictures through my zoomlens at 200 mm. I felt it to be too scary and too close. 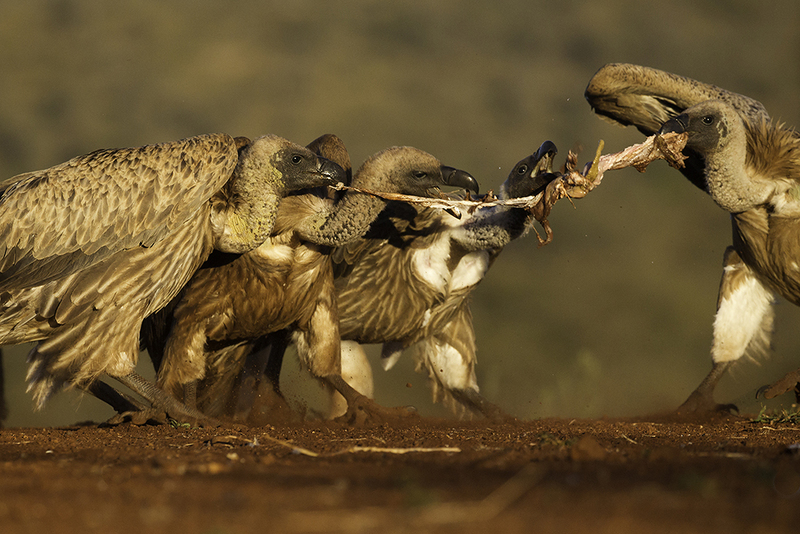 According to the guide we could have left him passing by, but as he just filmed, he had put aside the stick. I didn't feel safe. Anita an myself prefer not to die in a heroic photo shoot. 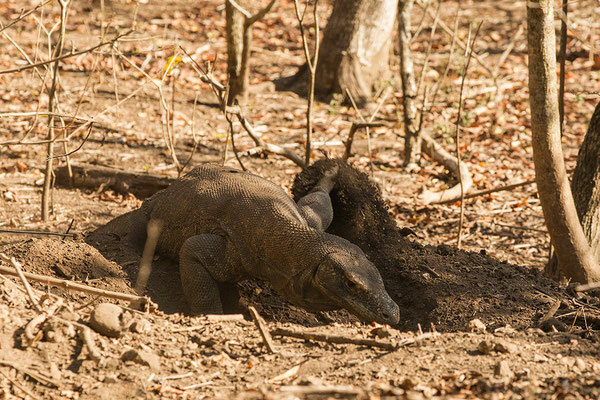 After this close encounter we continued our walk and saw another Komodo Dragon, Monkeys, Deer and a Water Buffalo. We climbed higher up into the hills and the landscape changed into an open landscape, with beautiful views. After the walk we relaxed a little bit at the ranger station. We saw more and more tourists coming and start their walk. As it was already hot we went back to the boat. After a while we went for a swim and enjoyed a beautiful bay, before returning to our hotel. Their we watched and photographed the sunset and the next morning I finally saw some birds and was even able to photograph them. The last few days of our trip we spend relaxing at the Puri Mas Beach Resort in Lombok. 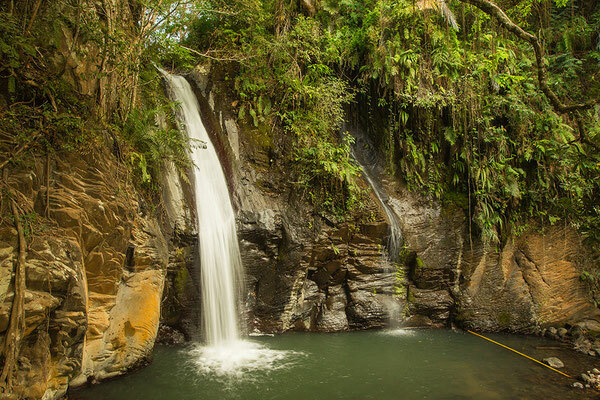 They do have a Spa resort around two kilometers away. 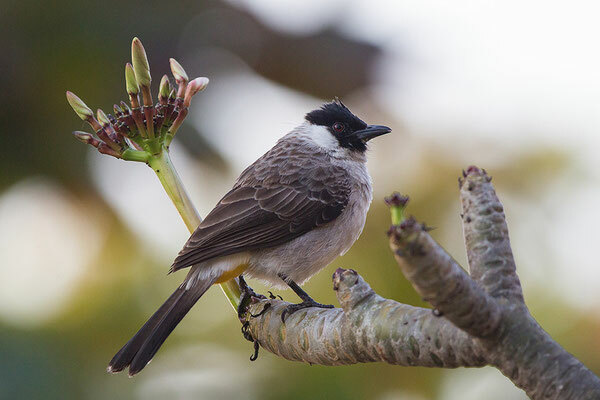 Enthusiastically we were told that next to the highly enjoyable massage, we could see some beautiful birds in the garden. 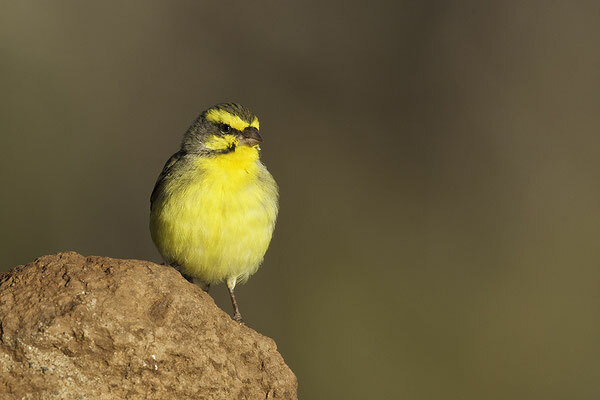 So the camera gear was packed as I expected to finally have a great birding experience. But by now I should have known better. The birds were in little cages or tied to a rope keeping them on their stick. It made us think of our guide in China who during a walk talked enthusiastically about the beauty of nature, pointing at a Peacock, from which feathers had been removed to stop him from fleeing. Also on Lombok the sunsets were beautiful! But enjoying nature seems to be restricted in Indonesia to the National Parks. 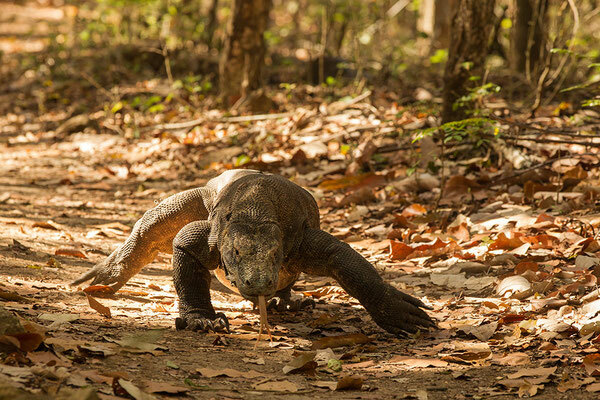 You can't expect to just encounter it in Indonesia. So in the end I didn't miss my 500 mm lens. Some more pictures taken. Last week I went to Finland to photograph bears. Something I considered allready for a number of years. But finally I went, as my wie went to the British Open to watch golf. But how do you know where to go? What are the best hides to stay in? I started searching the web and found several sites with hides in Finland. All with recommandaties of customers and none with complaints! So I changed the way Isearched into "photo, winning, bears". Soon I found Lassi Rautiainen and Artic Media. So I digged a little deeper and decided to contact Artic Media. Everything went well, but my favourite dates could not easily be realised and also the flights I had to book myself. So I used Sundowner to book the holiday. Their service was very good and they took into account my preference for Artic Media, which is also inwon under the name Wildlife Finland. Even when I had to Change dates they managed. Additional benefit of using Wildlife Finland is that they also indicated the possibility to see Wolverines and Wolves. 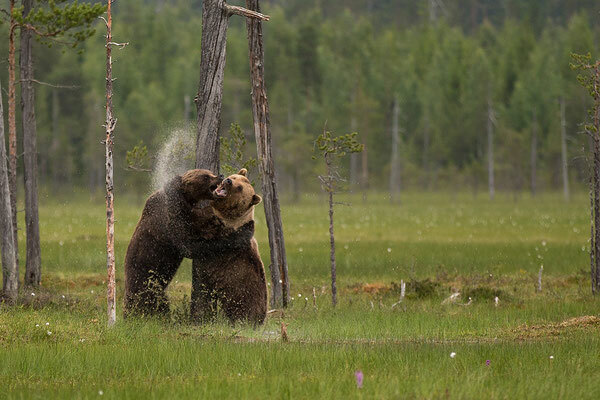 Party due to a dedicated hide (Wolverine) and partly as an extra while watching bears. 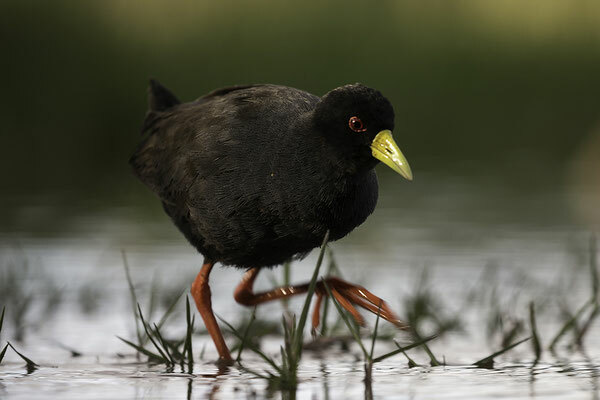 In order to benefit from these opportuniteit I wanted to stay a least 4 nights in the hides. Not a very comfortable idea, knowing that you sleep at the ground for a few hours. But you have to accept it for a few good pictures! On Sunday I left to Kajaani, via Helsinki. It started with a discussion at the check in desk about the weight of my carry on luggage. It weighted 15 kilo's, while 8 was allowed. Eventually I had to take some stuff from my bag. After getting the cabin tag I walked away and refilled the bag. 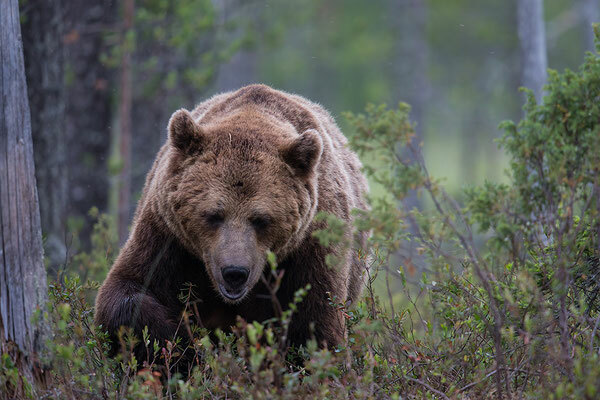 The stop over in Helsinki was long and from Kajaani we had to drive towards Kuhmo (100km) and from their another 60 km towards the Russian border. So I could have considered renting a car, but on the way back the trip would-be have been longer. We arrived 1.30 at night and I went immediately to bed for a sleep. Although I had been booked on a shared room I had my OWN private room. 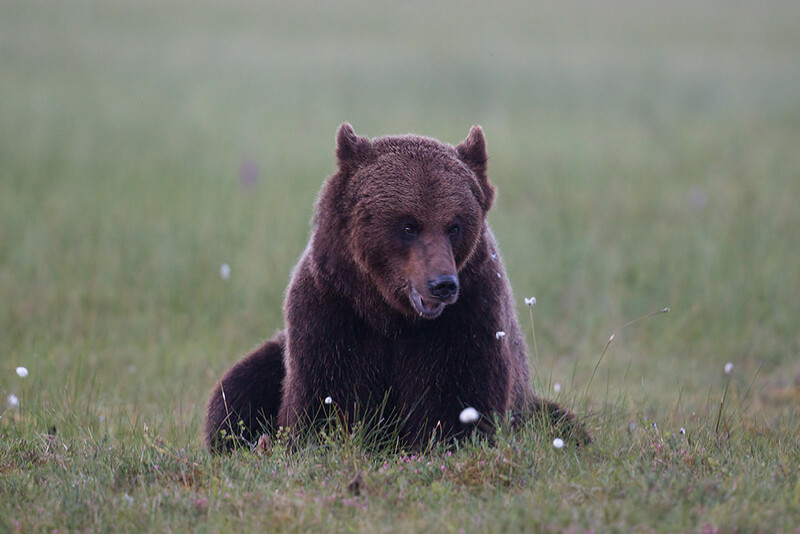 Around 9 o'clock at breakfast I spoke to the guesta that had stayed last night in the hides and they had Sen bears, Wolves and a Wolverine. So all reasons to look forward to the vorming nights! There are three locations with promising names as Paradise, a marsh field surroundgeluid by woods, Caravaan, a location in the Woods especially for Wolverines, and Lake, a small Lake in the woods. My first night I had the honour to go to Paradise. At 16 o'clock we had dinner and at 17 o'clock we left for the location. At Paradise I was allocaties a beautiful hide, suitable for more them one person. 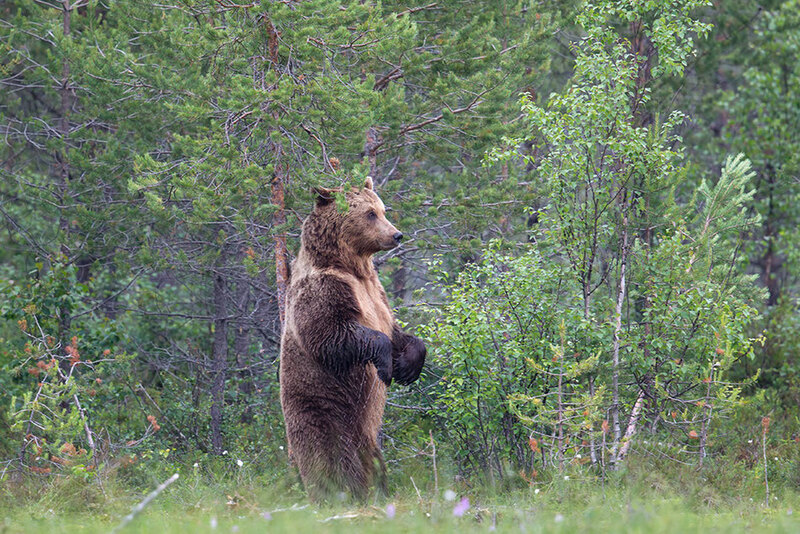 Allready 19 o'clock a bear appeared, and till 3.30 o'clock I saw in total 5 different bears. Unbelievabke how often they appeared. What an experience! I kept taking photo's! But I had to increases the ISO soon. In the middle of the night it even became to dark to photograph. Later I hard that far away a wolve had been Sen, but I missed it. I did sleep for a few hours, but have to admit it was rather cold. I had not counted on a temperature of 5 degrees Celsius. Normally I bring an extra trouser, but I had forgotten to bring it with me. But I will never forget this night! The second night I focused on the Wolverine. During the day I had slept for a few hours. Again we left at the end of the afternoon. The Wolverine is very shy and we were informed to remain as silent as possible. Especially for the Danish teenage girls, who acted as World Wildlife Reporters for a Danish TV station it seemed a great challenge. But they Managed to stay silent quite well! Once I had installed the camera, the waiting started. There wasn't much to see, which made the waiting tough. 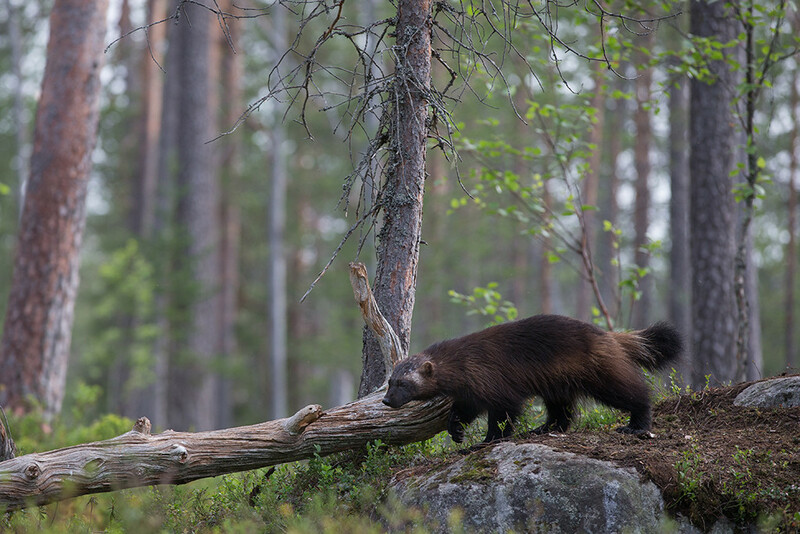 So I got really excited when the Wolverine appeared, which happened around 19.30. It's first apparaten was behind a rock. I heard the camera's click of the other photographers. But suddenly the Wolverine made a private visit to my hide. It posed a minute in front of my hide. I was so impressed that I nearly forgot to photograph. So close! Luckily I had made, based on the guidance of Sami, Son of Lassi, the right choice and installed my 70 - 200 mm lens. The result is this picture! 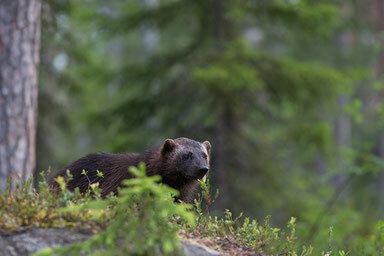 The Wolverine returned later, but light wás more difficult and the position choken for my 500 mm lens was wrong. In order to disturb the animals you can't change the position during the night. Went for a timely sleep, which this time felt comfortable. The third night was the best. This time I went to Lake and I had afreed with Morten, one of the guides and videoman of the Danish girls, to keep each other updates on sightings via SMS. We saw 5 bears and three possibly four different Wolves! 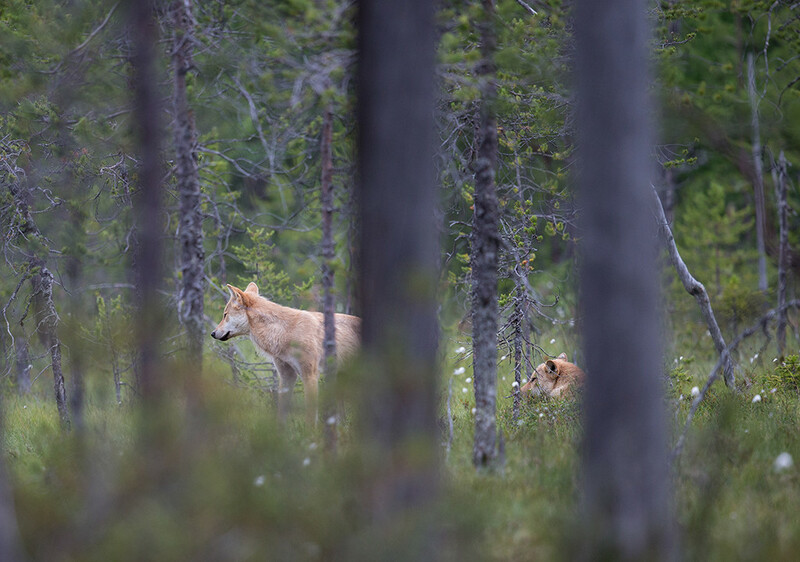 The Wolves remained a long distantie away and were difficult to photograph. For the first time I had to use ISO 51.200. Especially at 1.30 during the night when the Wolves tried to steak the maat from a bear called Panda. I did sent a message to Morten, but unfortunately hè did not hear it and he stayed a sleep. 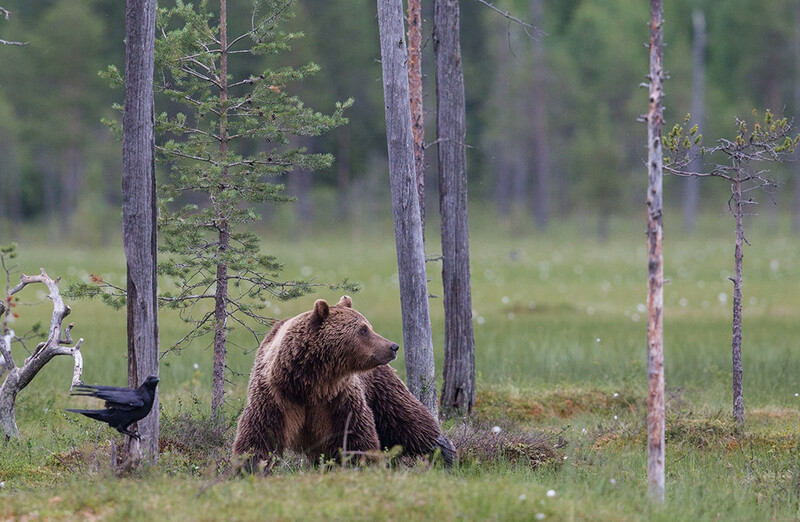 The Wolves made it difficult for the bear to leave the scene. They wanted till the bear had torn a piece of meat from the carcasses. The bear walked from time to time to the left and to the Right. 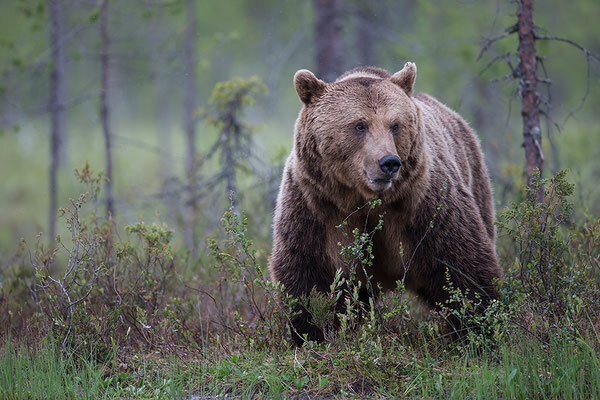 The Wolves reacted immediately and the bear quickluy went back to grap a bite! At a certainty moment a young bear appeared at the scene. 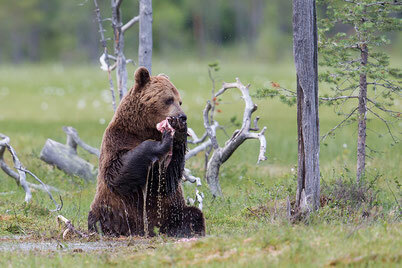 The young bear found a piece of meat and started to eat. 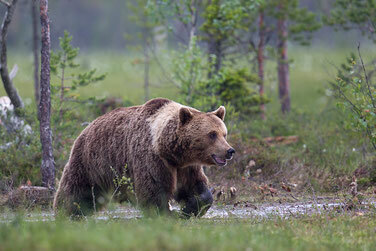 But suddenly the Wolves changed teir focus and turner to the young bear and started to chase HIM. 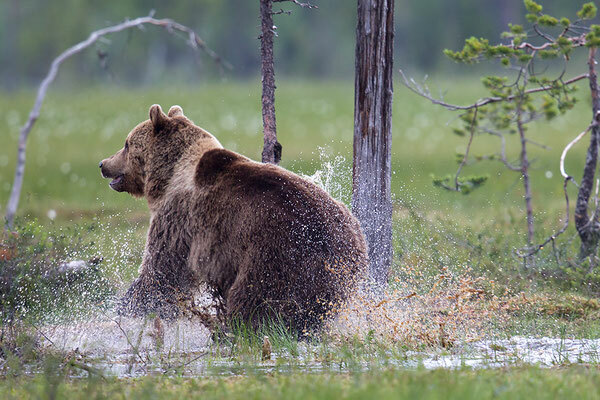 Soon the young bear droppen the meat, which was quickluy taken by the Wolves. 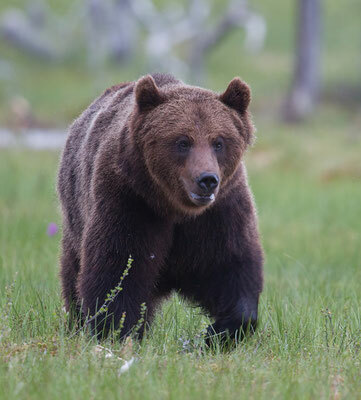 The older bear benefitted from this change and quickly left the scene. The night returned and I fell a sleep. Next morning no more bears, but beautiful light! And a great memory of a historical night. The fourth night I went again to Paradise. 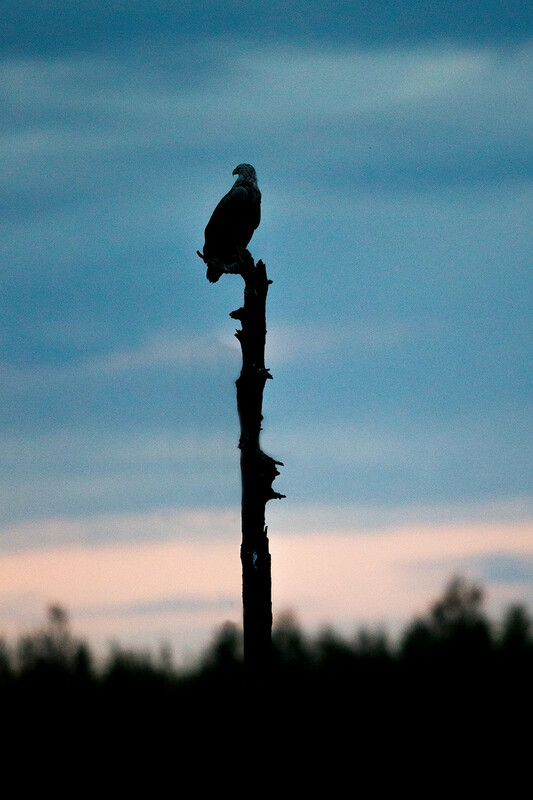 It was the evening of the great White-Tailed Eagle show. 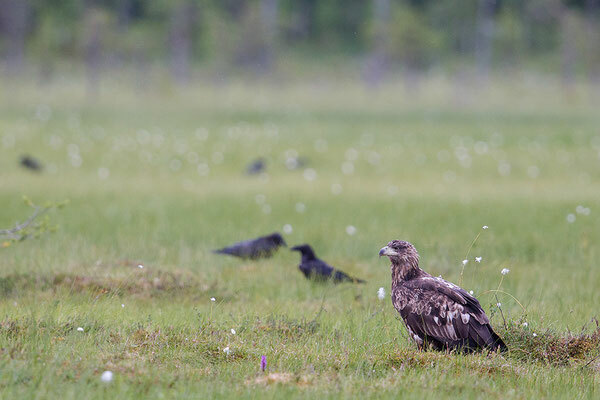 Two young eagles of 1 and 2 years old and an adult made the lief of the gulls tough. As a birdphotographer I was from time to time so excited that I did forget the bears. From the hide it was difficult to take good bird photographs as it was difficult to follow the birds in their flight. So eventually I still did see 7 different bears. 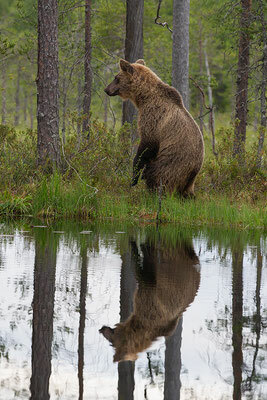 Morten and I did sent several test messages with "another bear on the left side". Quite remarkable as monday night many bears came from the right. 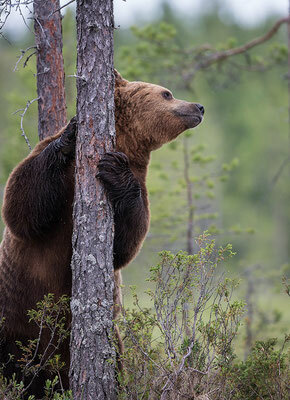 The bears looked also quite nerveus and they wandered around the woods carefully. 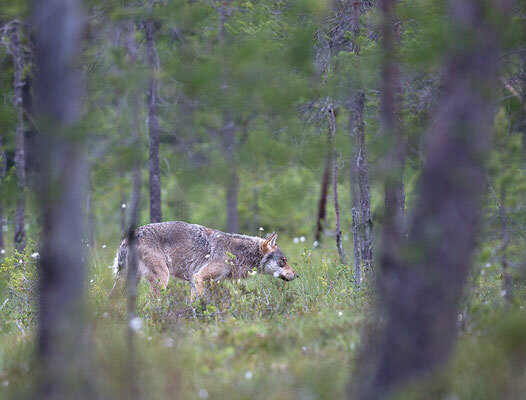 We will never know whether the Wolves were around. They did, contrary to the evening before, when they were chasing a bear in the open field in front of the camera's of the Danish team, not show up in the open field. Sometimes you just have to be lucky, which we were the evening before! At 1.30 it started raining heavily. Less and less bears showd up and even the gulls disappeared. Time to return home. With a great memory of 4 unforgetable nights. I can recommend everybody to go for the same experience. 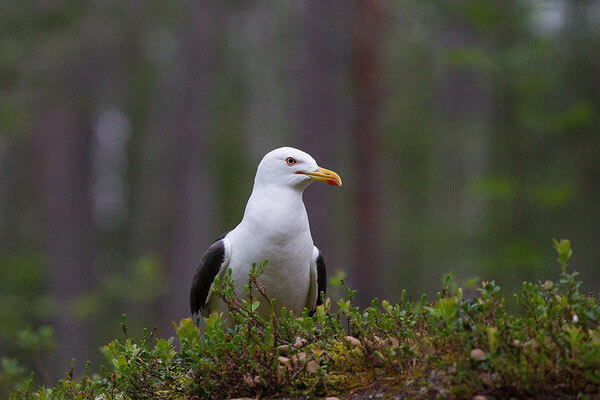 And the great professional at Wildlife Finland helpen me to take memories home through the photo's shown below. I' m allready thinking about when to go back!